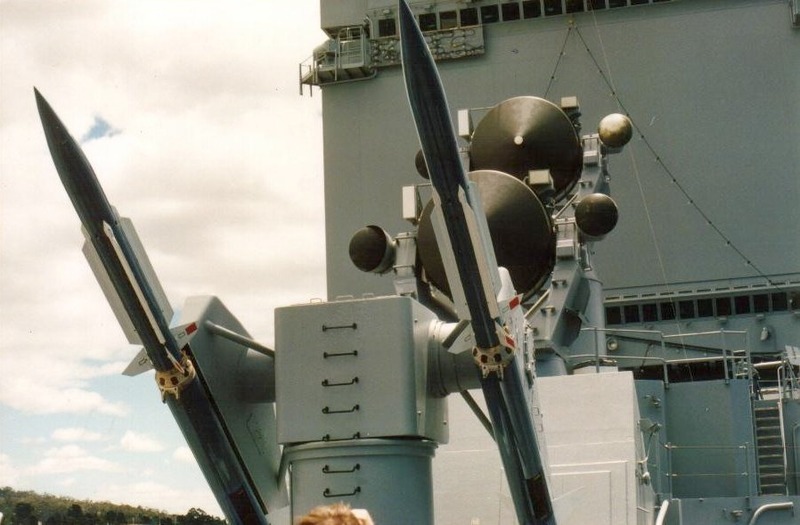 Tactical Voice Radio Call: "ALCOA"
ASROC (20 Missiles) 6 x12.75" TT. 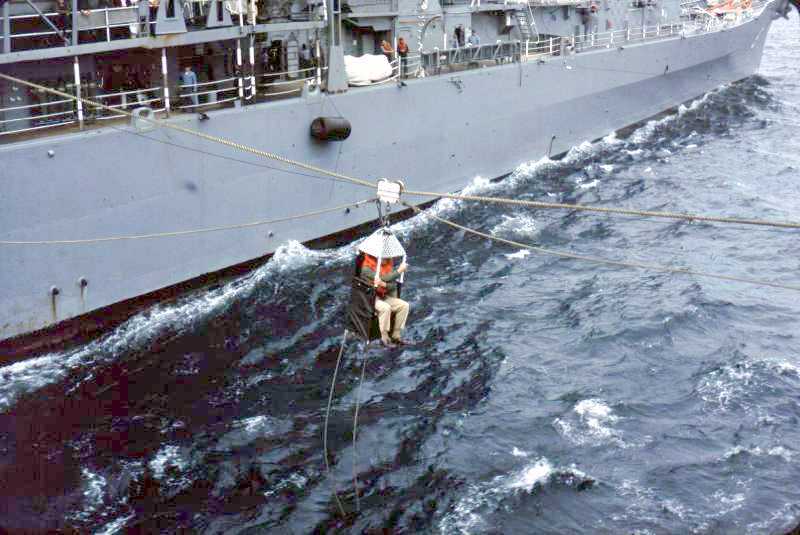 Speed, 30+ Knots, Crew 1100. 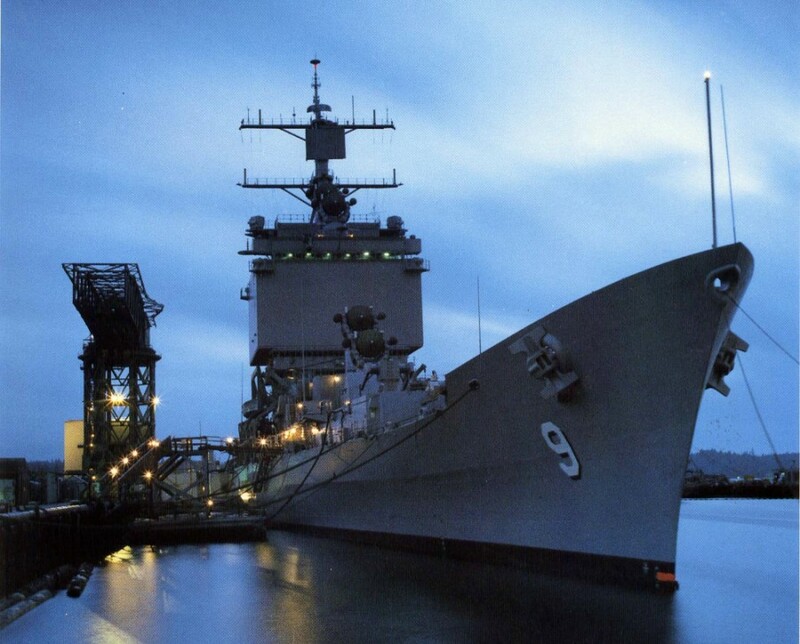 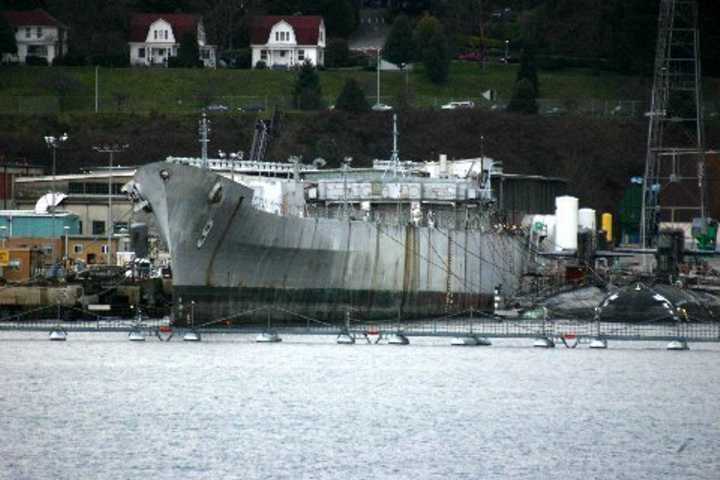 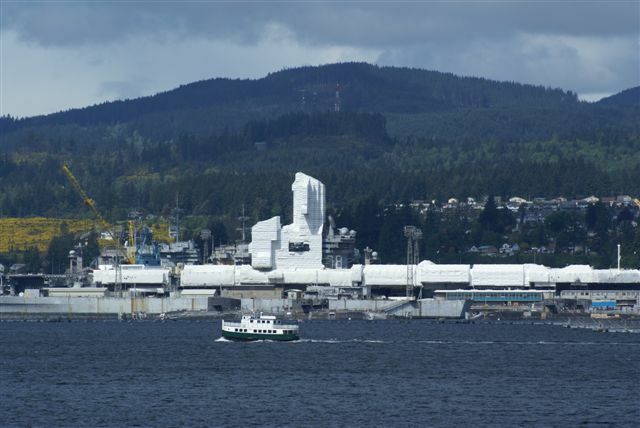 Fate: Stricken - Superstructure and Nuclear Reactor recycled at Puget Sound Naval Shipyard 25 September 2002. 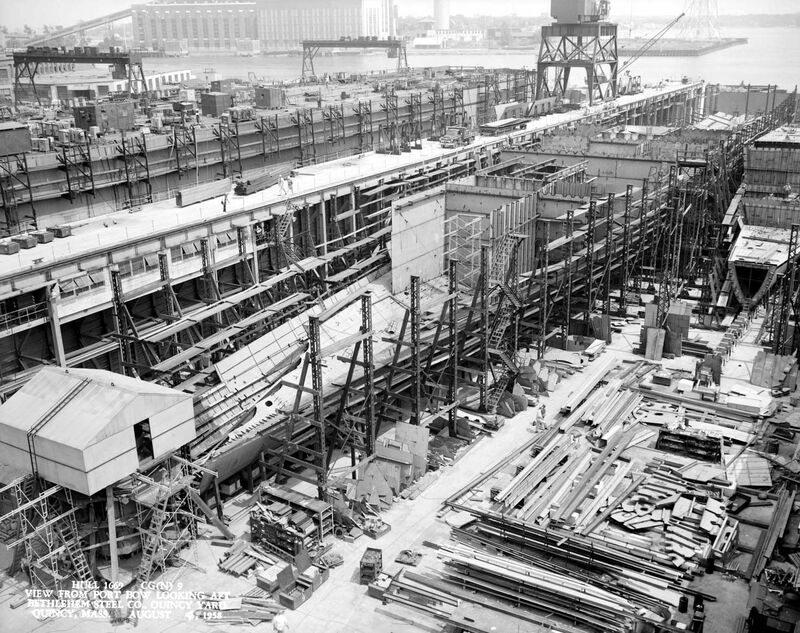 Hull auctioned for scrap to Tacoma Metals on 12 July 2012 for around $900,000..
Long Beach under construction at Fore River Shipyard 4 August 1958. 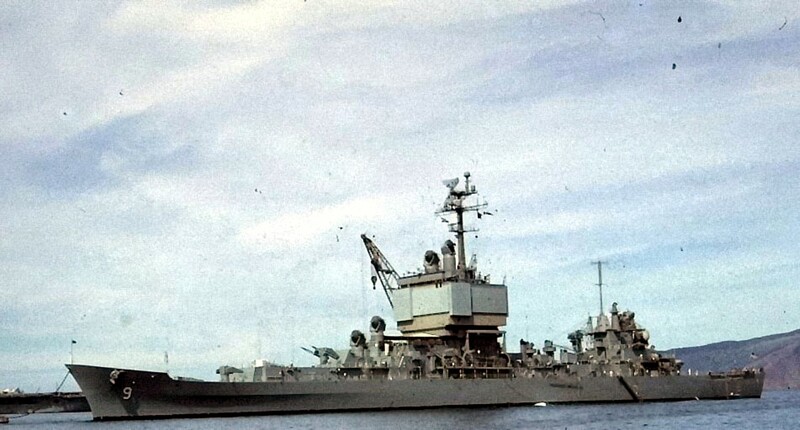 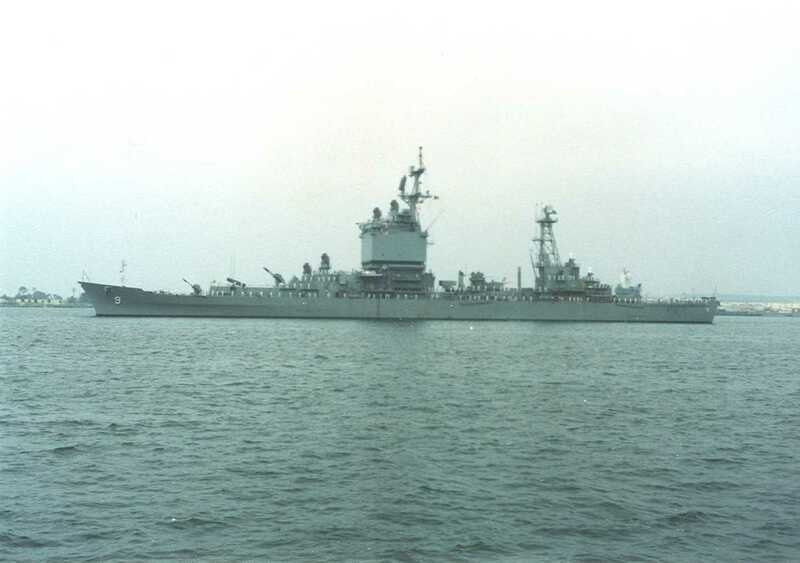 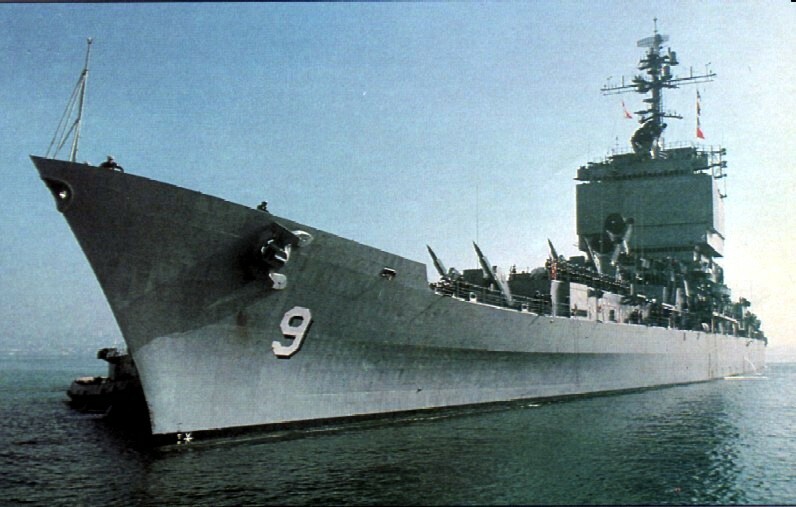 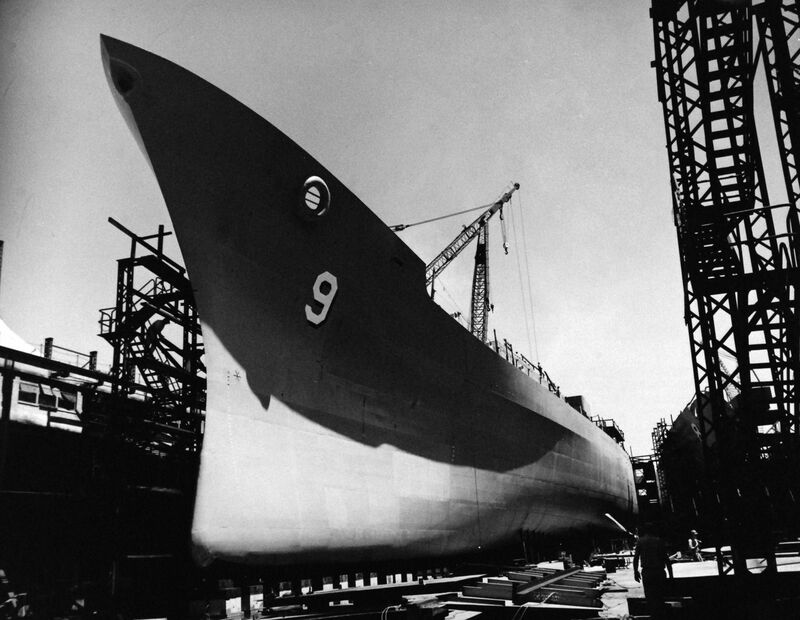 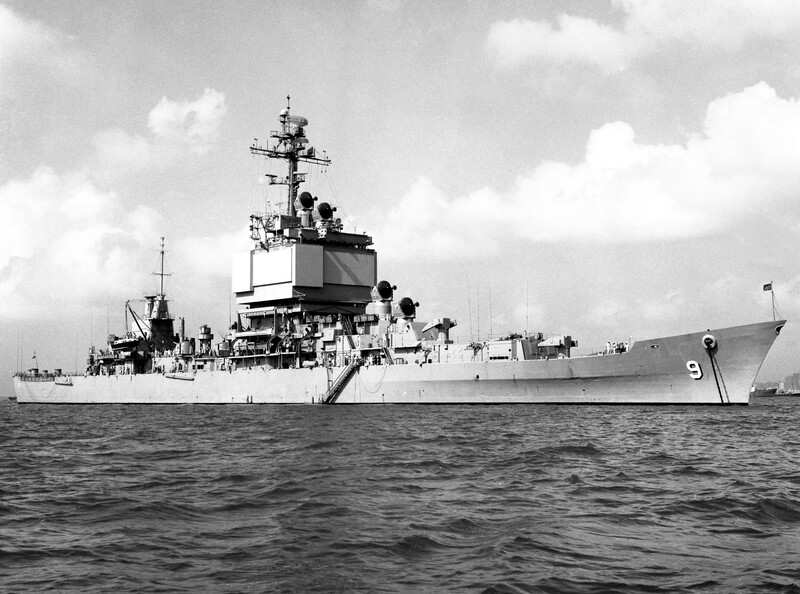 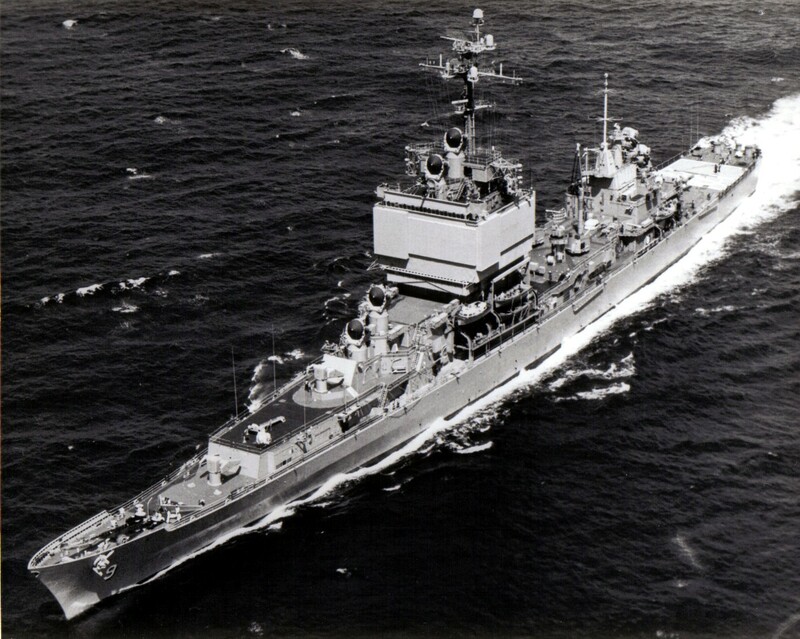 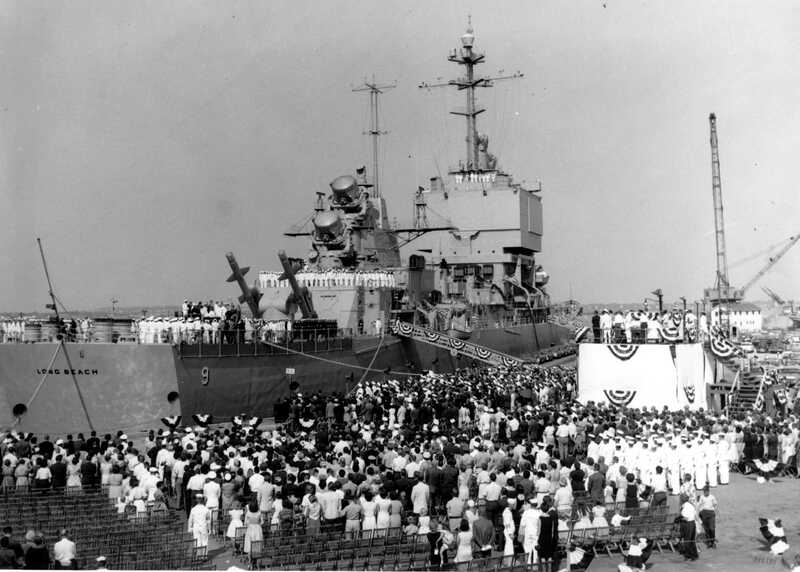 Long Beach is about to receive her bow at Quincy, MA in May 1959. 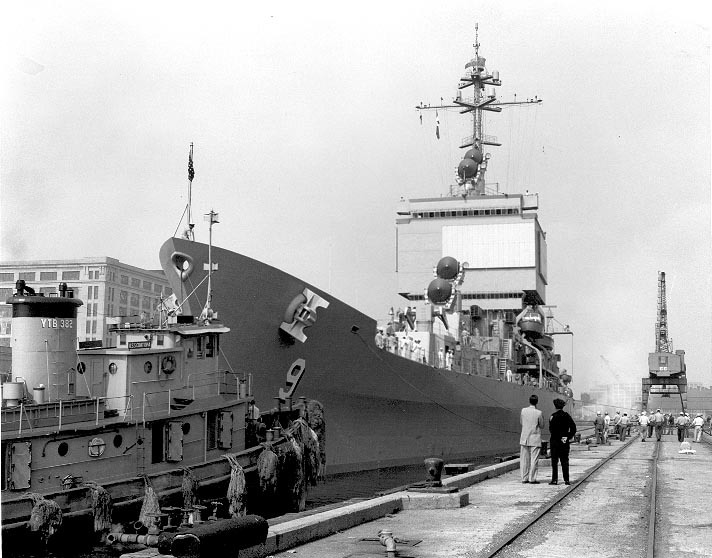 An undated photo prior to her launch. 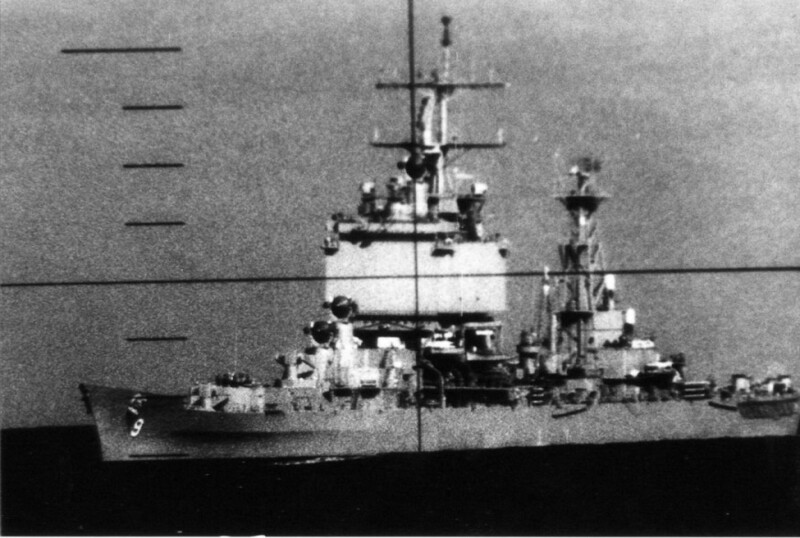 This photo is a great example of her traditional "cruiser" lines. 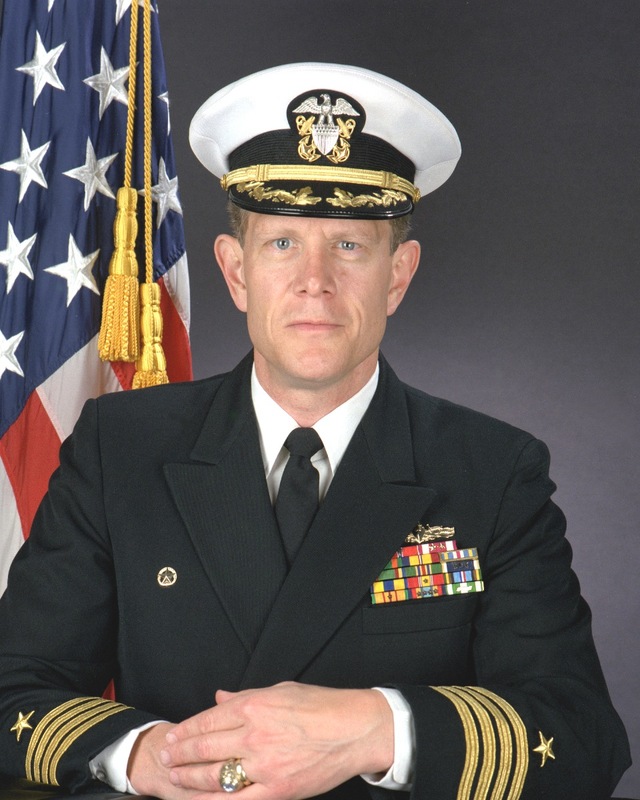 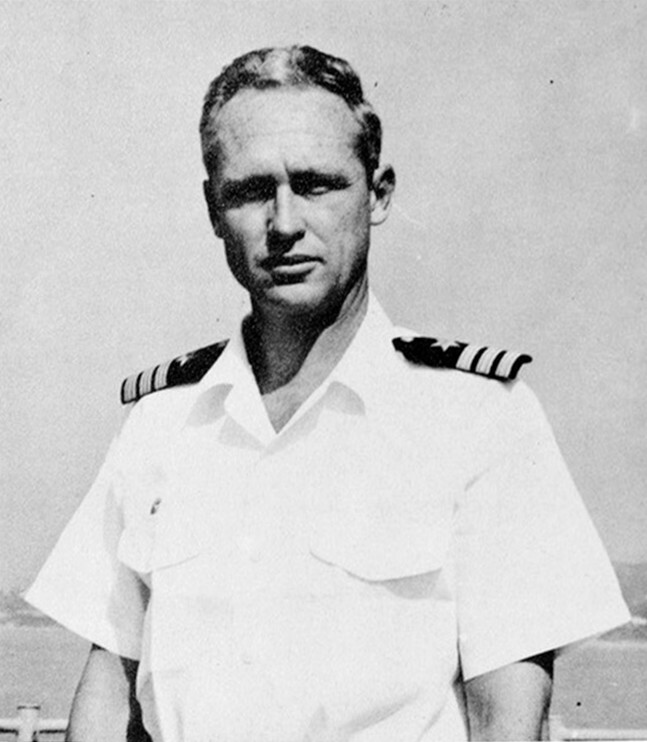 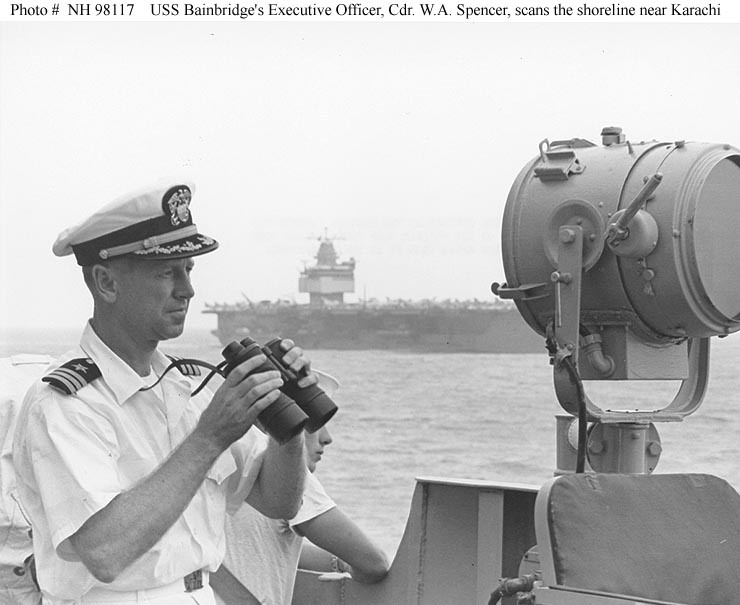 Captain Edgar H. Batcheller, Supervisor of Shipbuilding at the Quincy shipyard. 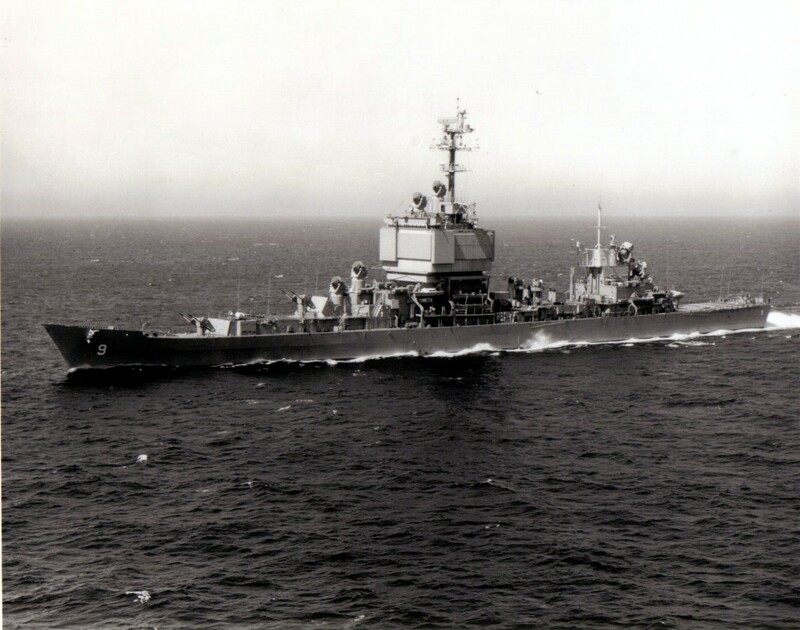 Official U.S. Navy Photograph, from the collections of the Naval Historical Center #NH 51358. 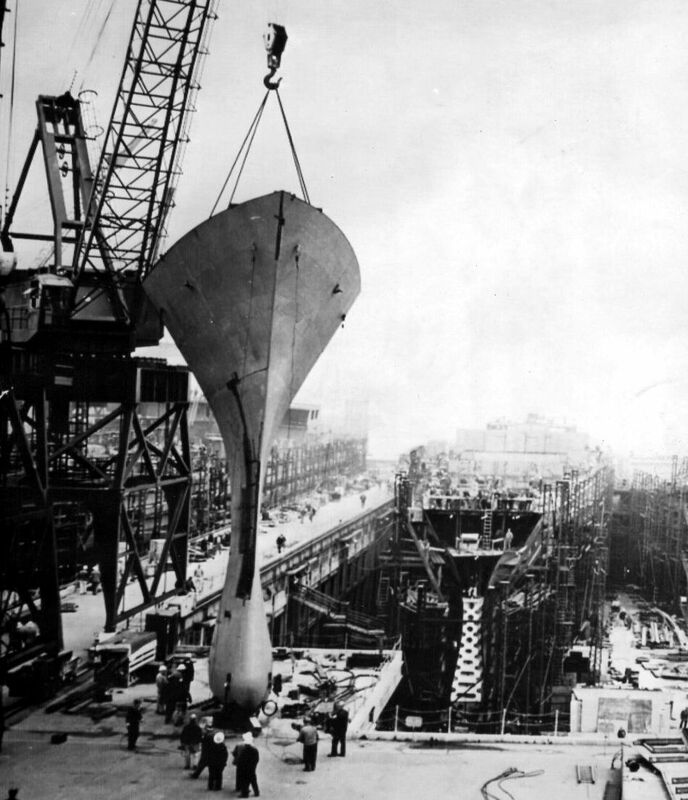 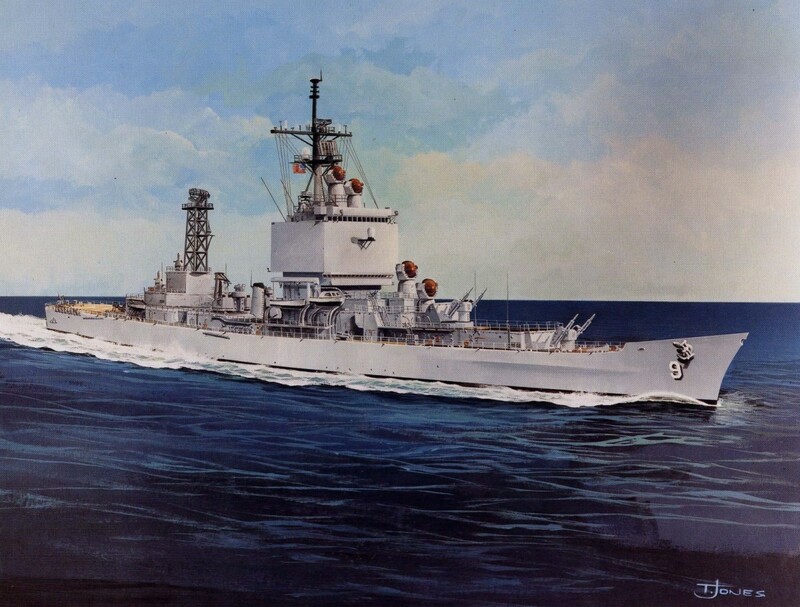 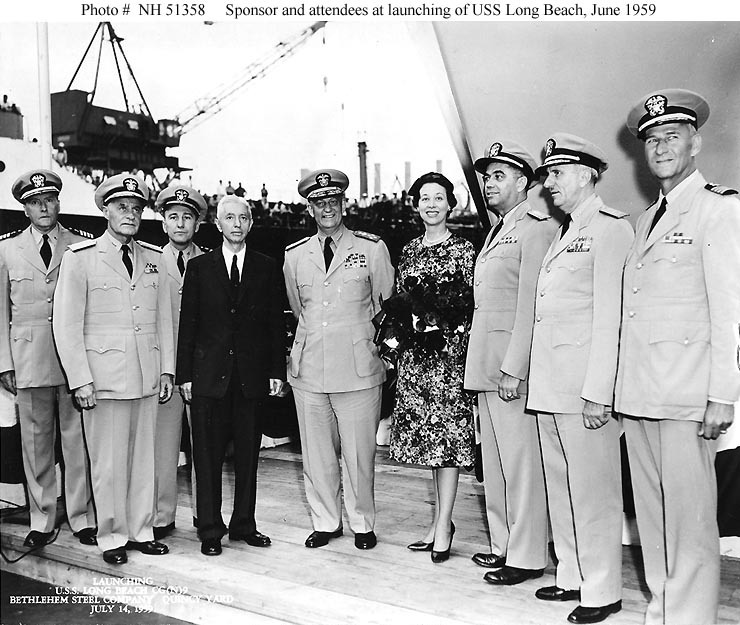 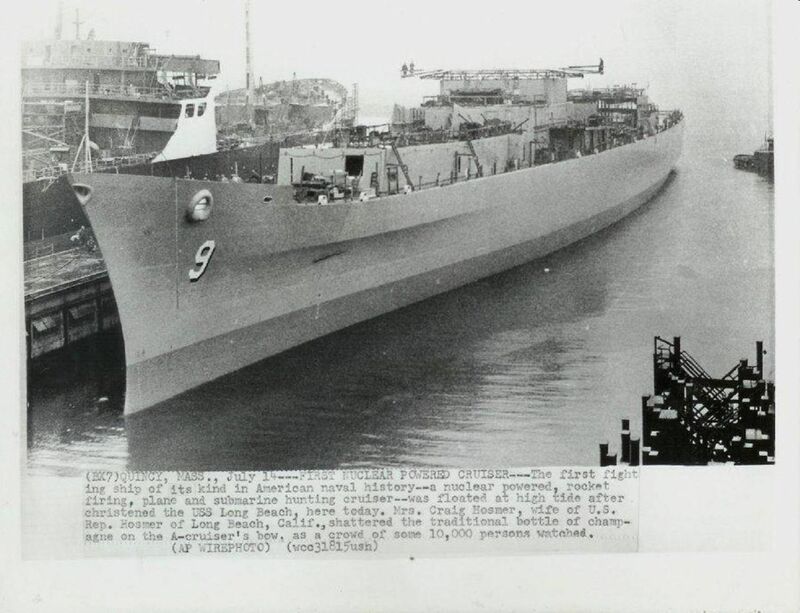 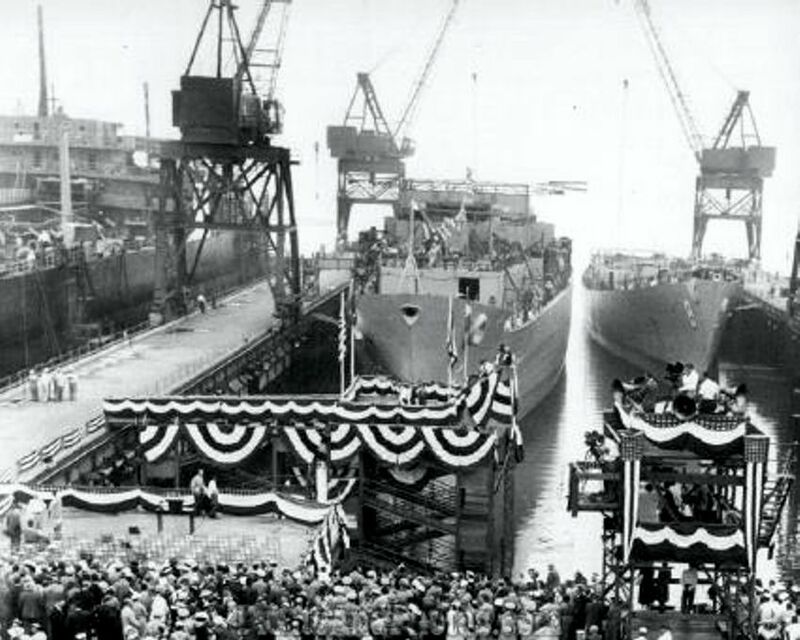 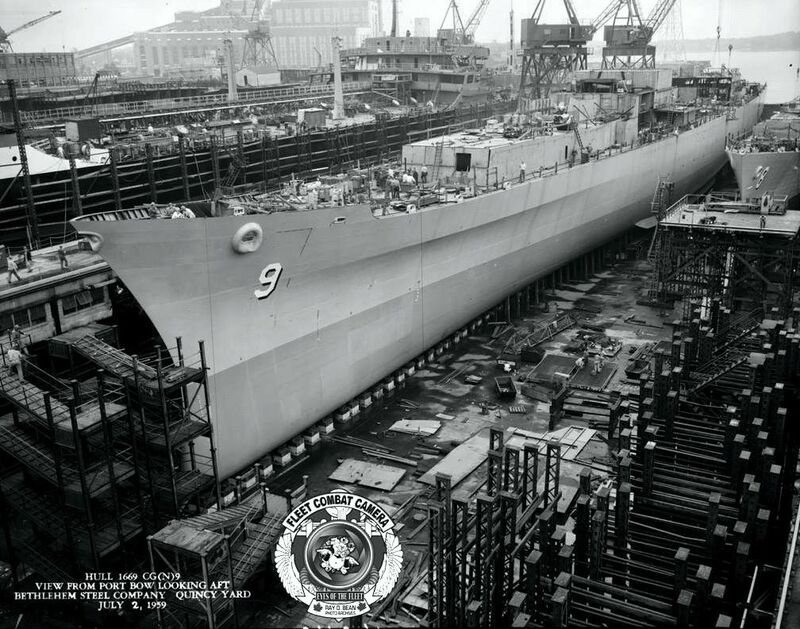 "(BX7) QUINCY, MASS., July 14---FIRST NUCLEAR POWERED CRUISER---The first fighting ship of its kind in American naval history--a nuclear powered, rocket firing, plane and submarine hunting cruiser--was floated at high tide after christened the USS Long Beach, here today. 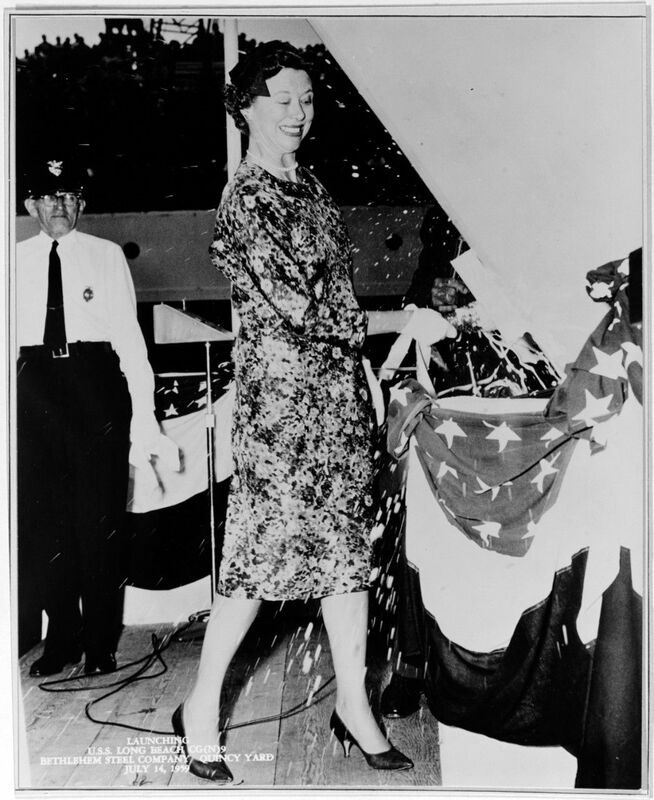 Mrs. Craig Hosmer, wife of U.S. Rep. Hosmer of Long Beach, Calif., shattered the traditional bottle of champagne on the A-cruiser's bow, as a crowd of some 10,000 persons watched. 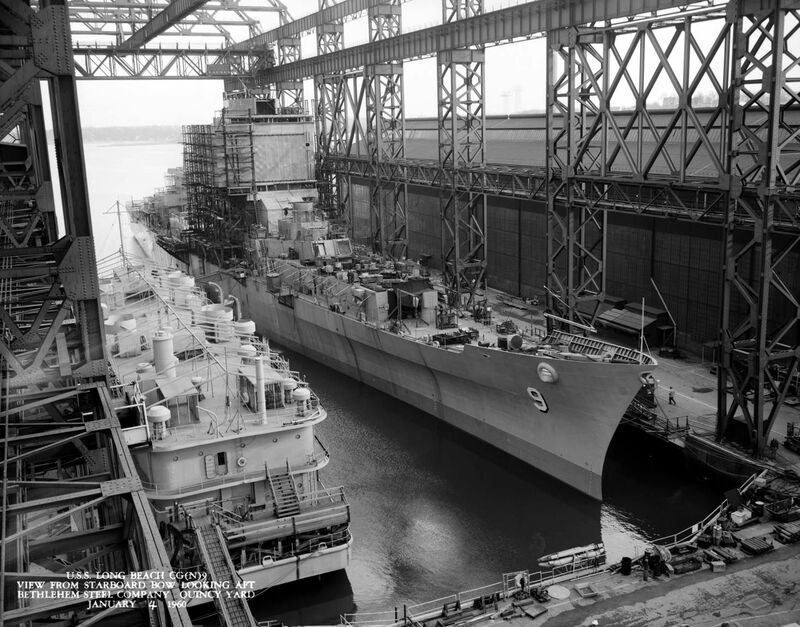 (AP WIREPHOTO) (wcc31815usn)"
Long Beach, moored at Bethlehem Steel Company, 4 January 1960. 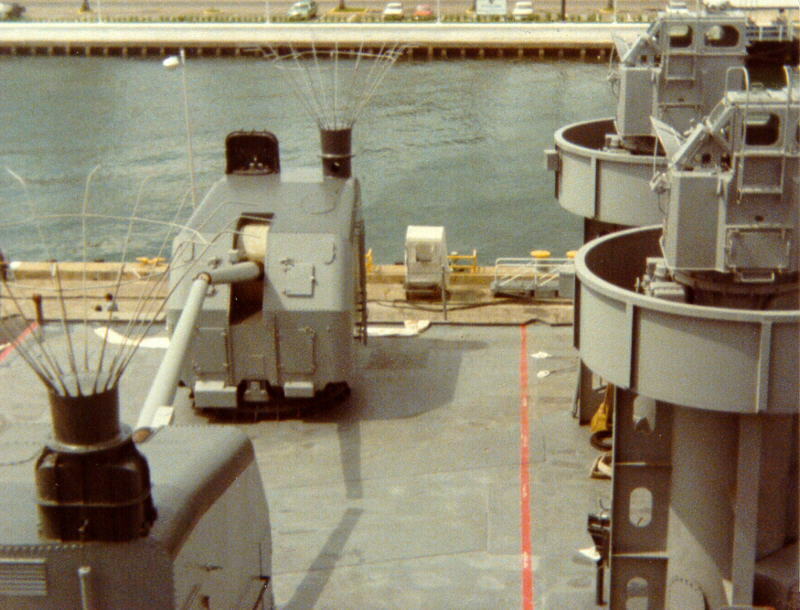 04010901 84k The two 5-Inch/38 gun mounts which were installed midships as directed by President Kennedy. 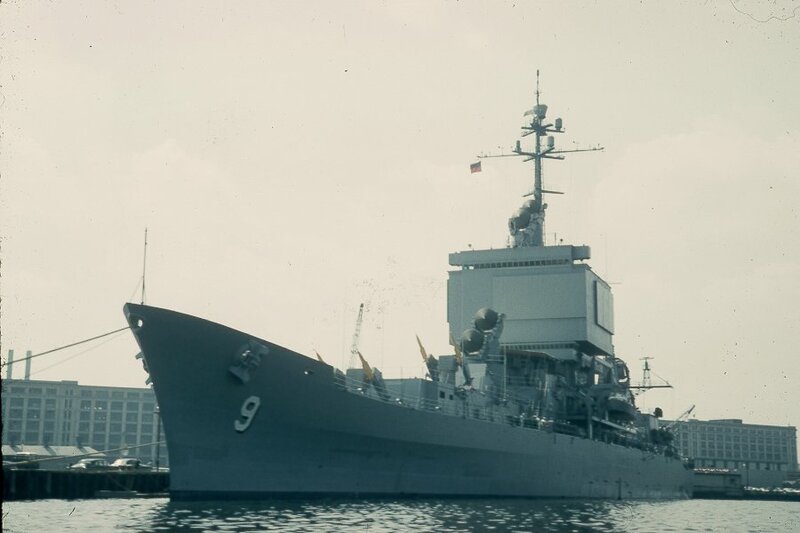 USS Long Beach (CGN 9) underway in Boston Harbor in the summer of 1961. 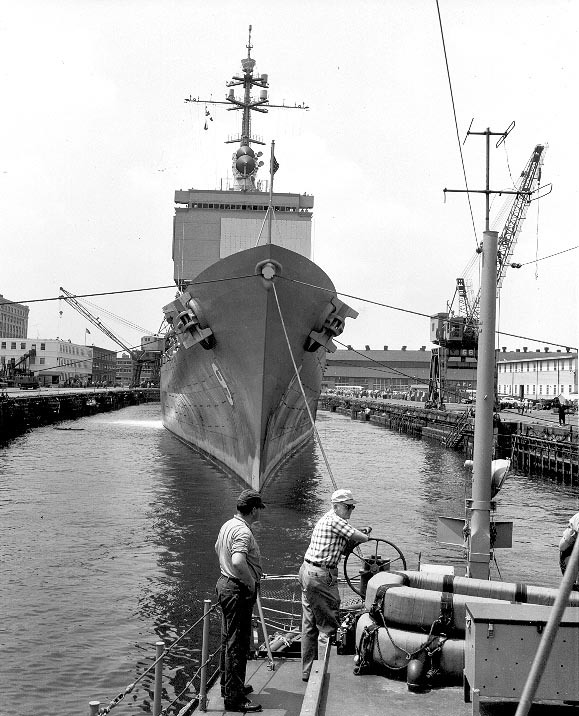 Assisted by the tug USS Coatopa (YTB 382), USS Long Beach (CGN 9) is maneuvered in Dry Dock 3 at the South Boston Annex of Boston Naval Shipyard on 7 July 1961. 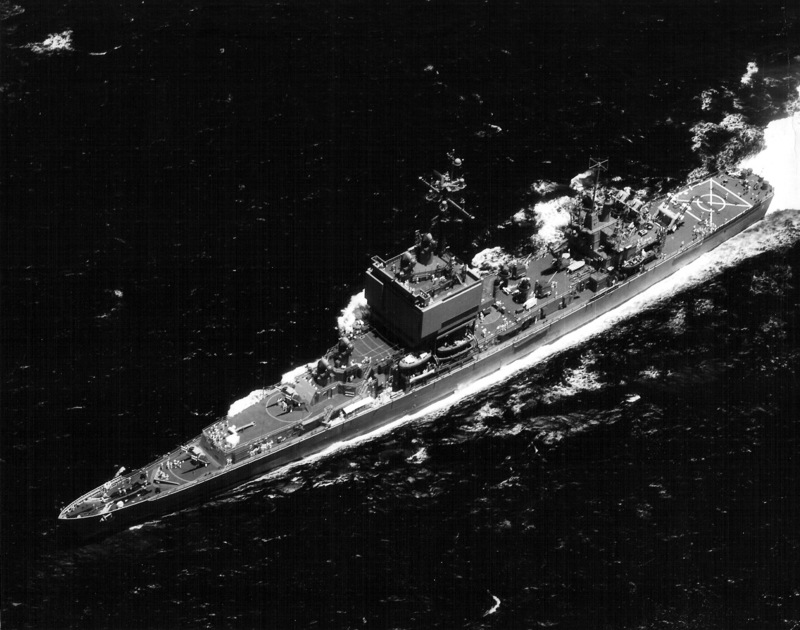 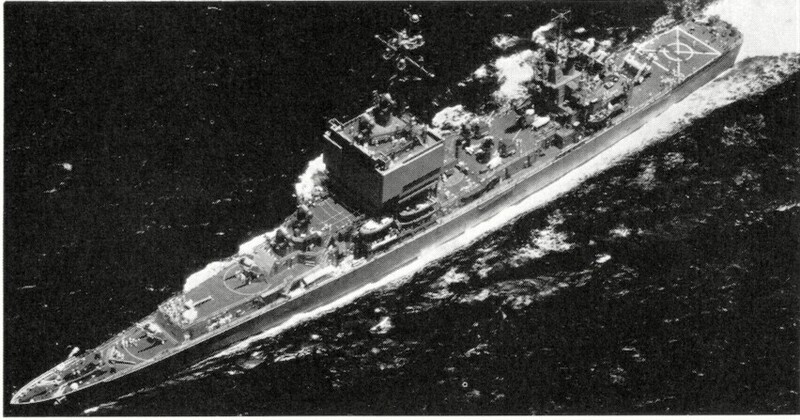 Port bow Aerial view while underway in Massachusetts Bay on her first Builder's Sea Trials from Bethlehem Steel Corporation Shipyard at Quincy, 7 July 1961. 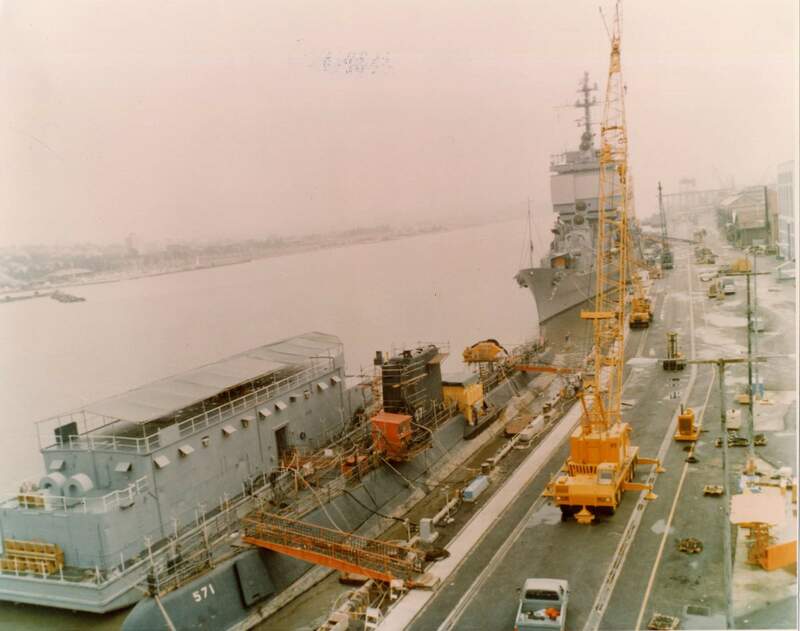 Note that the AN/SPS-33 antennas have not yet been installed on the superstructure, the ASROC launcher has not yet been placed midships. 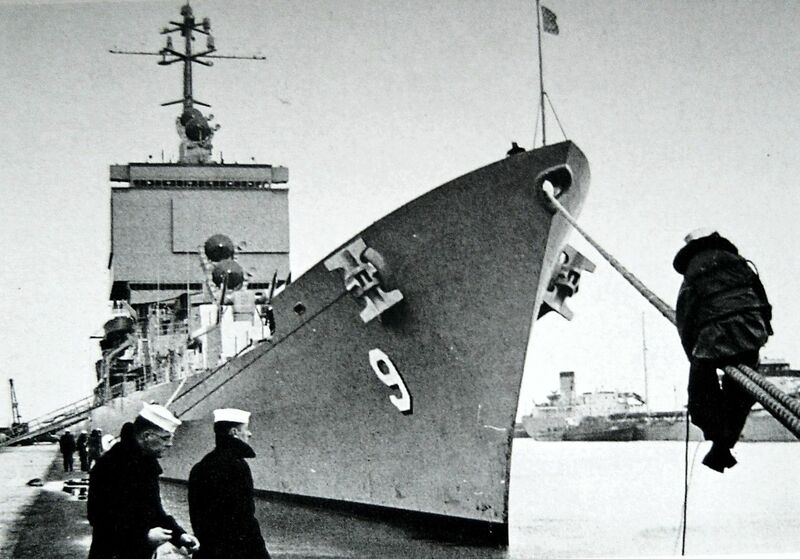 View of the 9 September 1961 commissioning ceremony for USS Long Beach (CGN 9) at the West Jetty of the South Boston Annex of Boston Naval Shipyard. 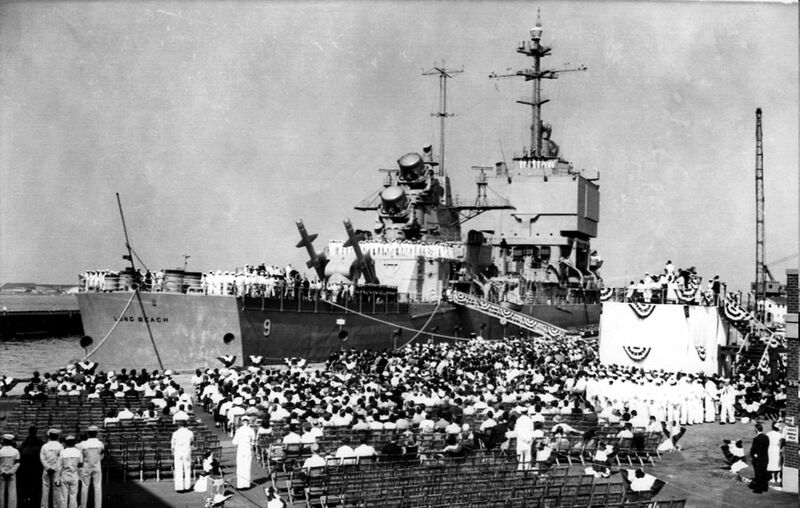 View of the commissioning ceremonies of USS Long Beach (CGN 9) at Quincy, Mass on 9 September 1961. 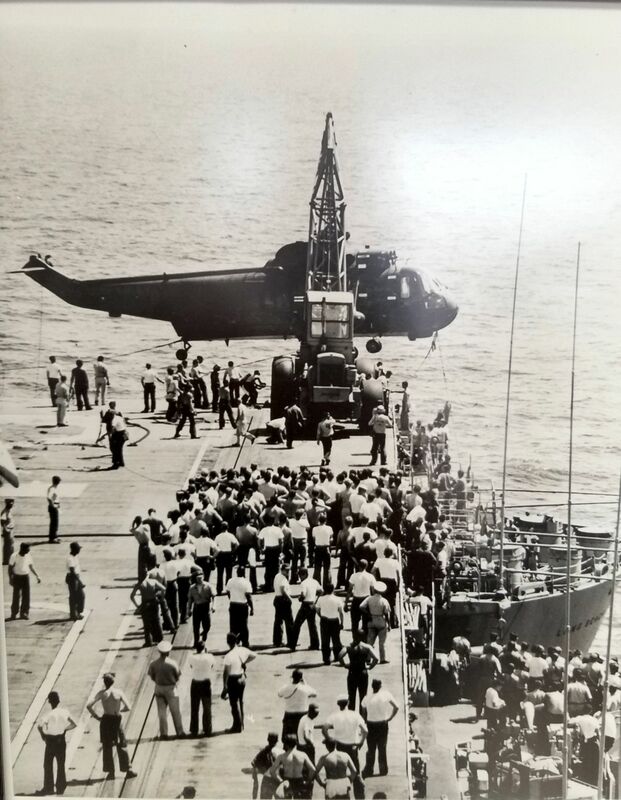 From the Vallejo Naval and Historical Museum. 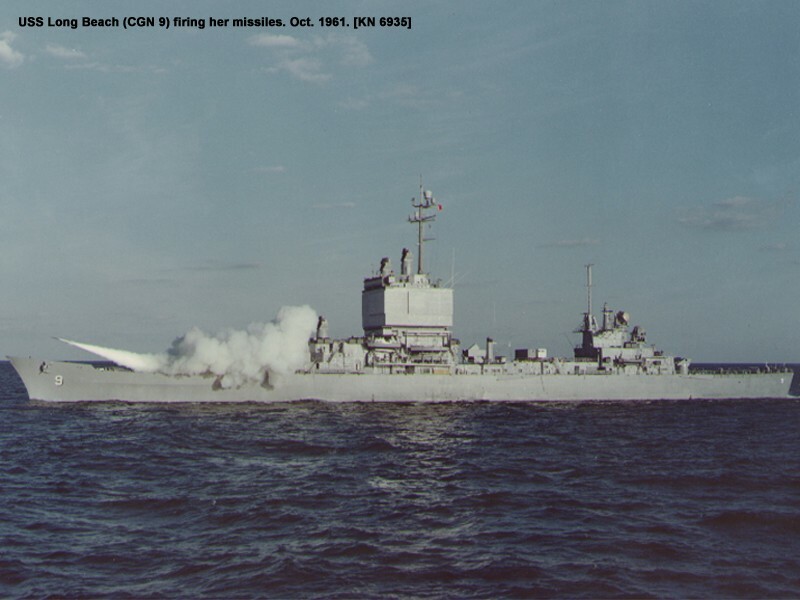 USS Long Beach firing a Terrier missile, October 1961. 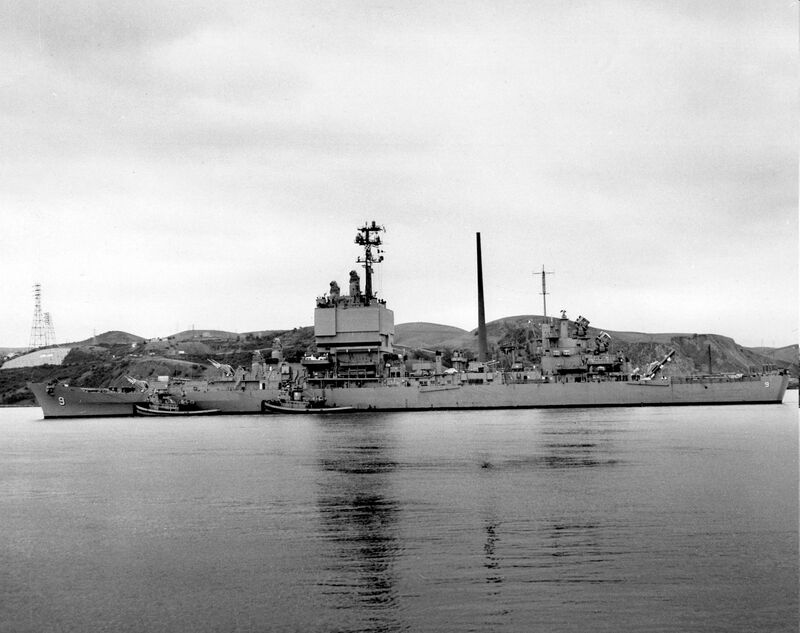 National Archives photo- KN 6935. 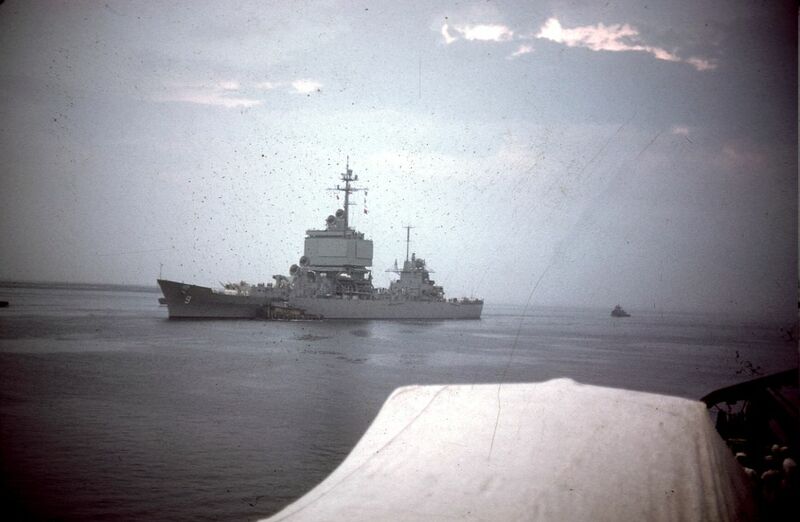 USS Enterprise (CVAN 65) underway in formation with USS Long Beach (CGN 9), center, and USS Bainbridge (DLGN 25), at top, probably in the Mediterranean Sea in June-July 1964. 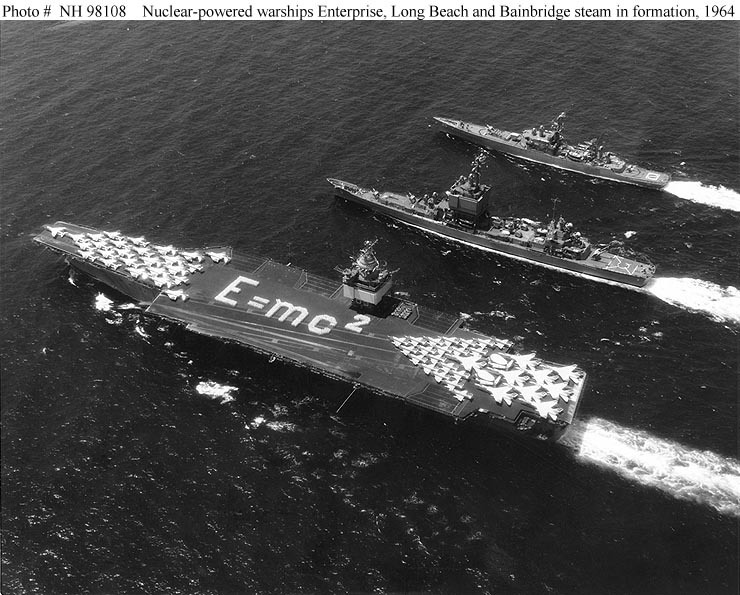 Members of Enterprise's crew are in a flight deck formation spelling out Albert Einstein's equation for nuclear energy. 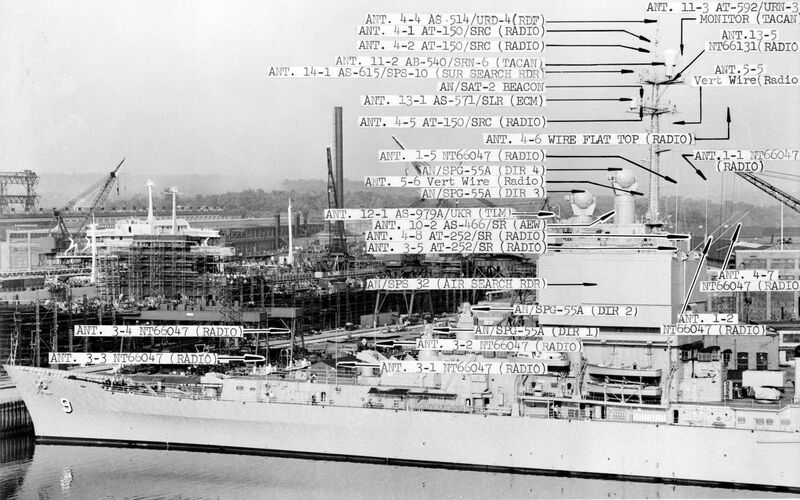 Planes on her flight deck include 9 A-5, 22 A-4; 10 F-4; 14 F-8 and 2 E-1 types. 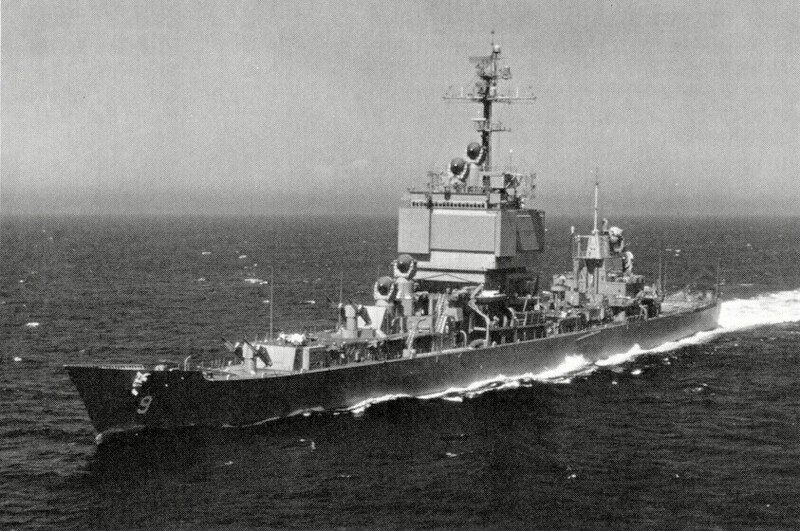 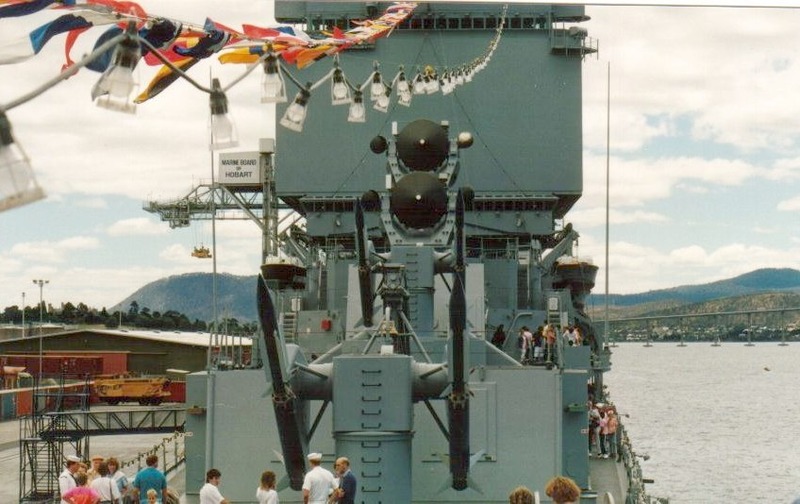 Those aft are parked in an arrowhead arrangement. 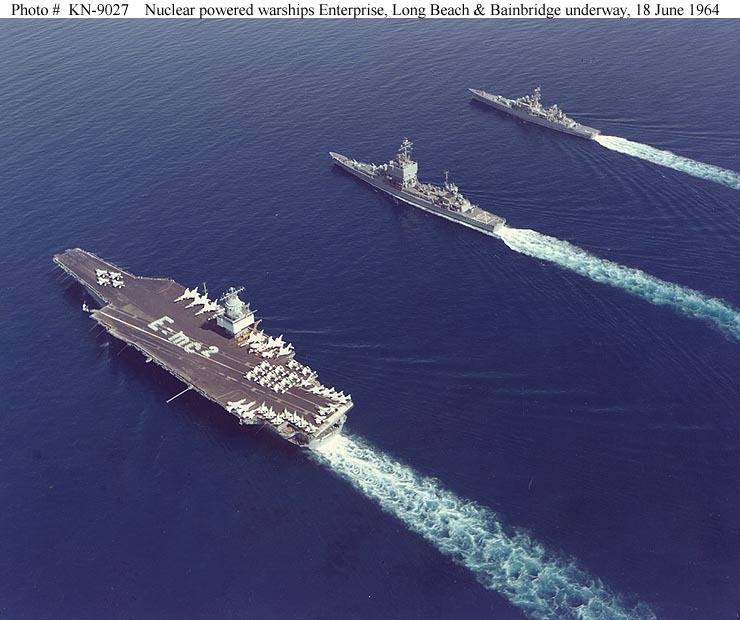 The photograph was released for publication on 30 July 1964, upon the commencement of Operation "Sea Orbit", the circumnavigation of the World by Task Force One, made up of the Navy's first three nuclear-powered surface ships. 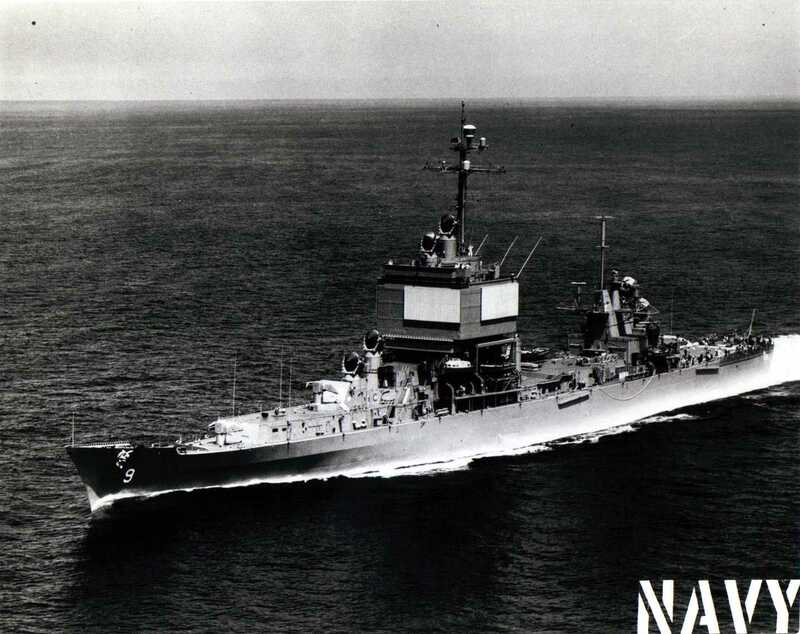 Official U.S. Navy Photograph, from the Collections of the Naval Historical Center #NH98108. 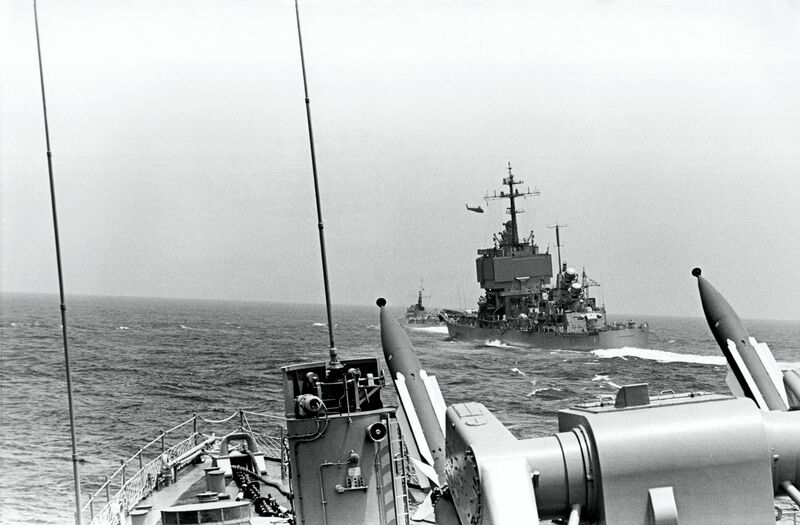 Task Group of Nuclear-Powered Surface Ships operating in formation in the Mediterranean Sea, 18 June 1964. 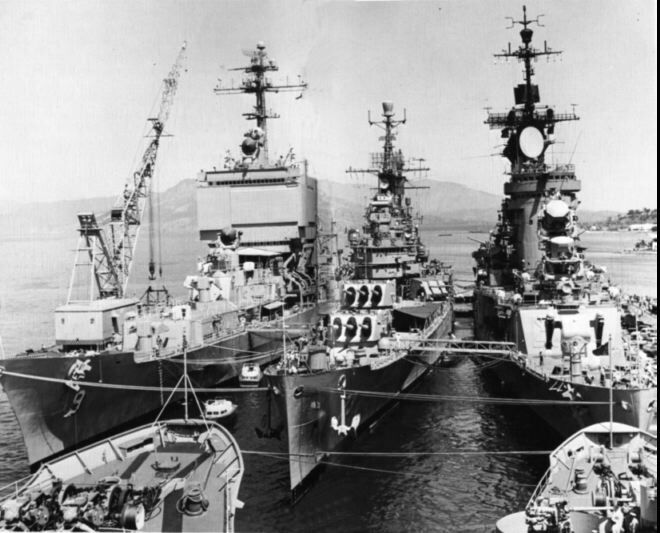 The ships are the aircraft carrier USS Enterprise (CVAN 65), at left; the guided-missile cruiser USS Long Beach (CGN 9), in center; and the guided-missile frigate USS Bainbridge (DLGN 25), at right. 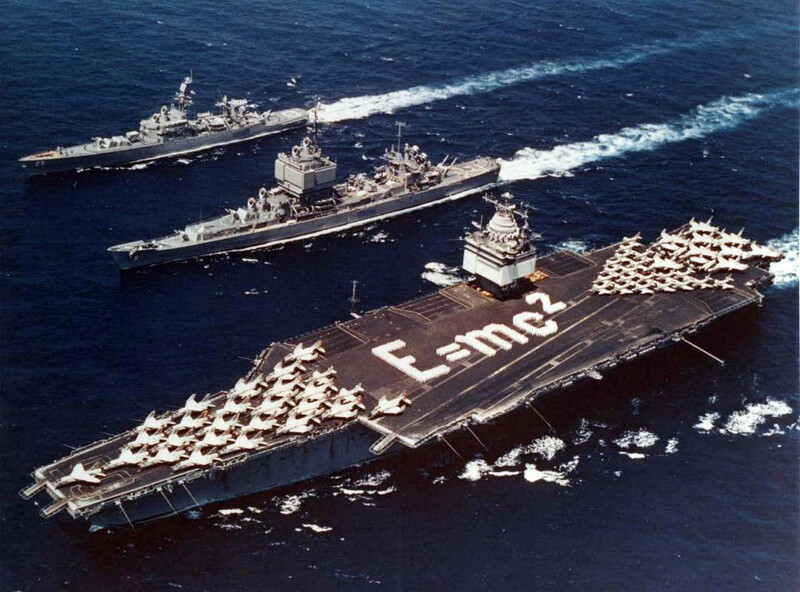 Enterprise crewmembers are spelling out Albert Einstein's equation for nuclear energy on the flight deck. 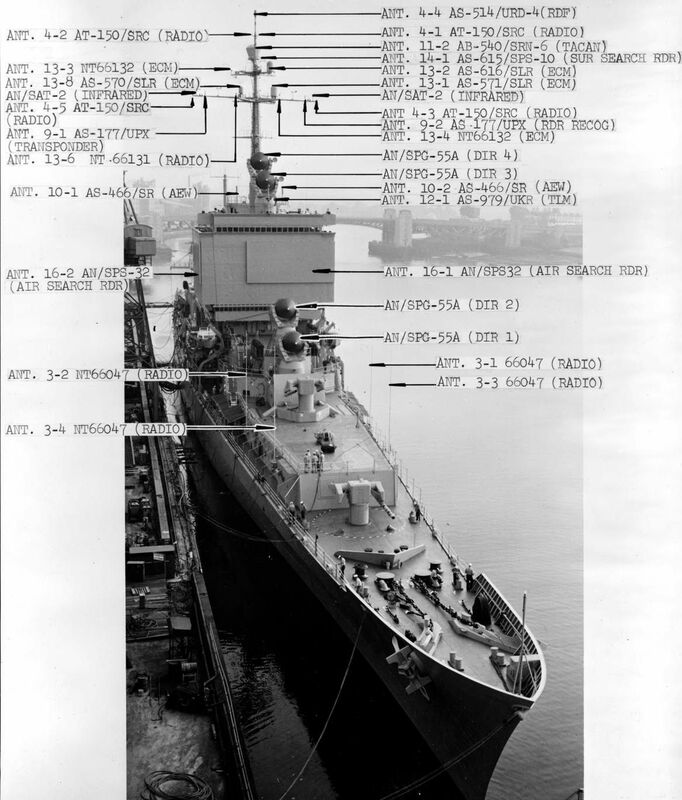 Official U.S. Navy Photograph (# KN-9027). 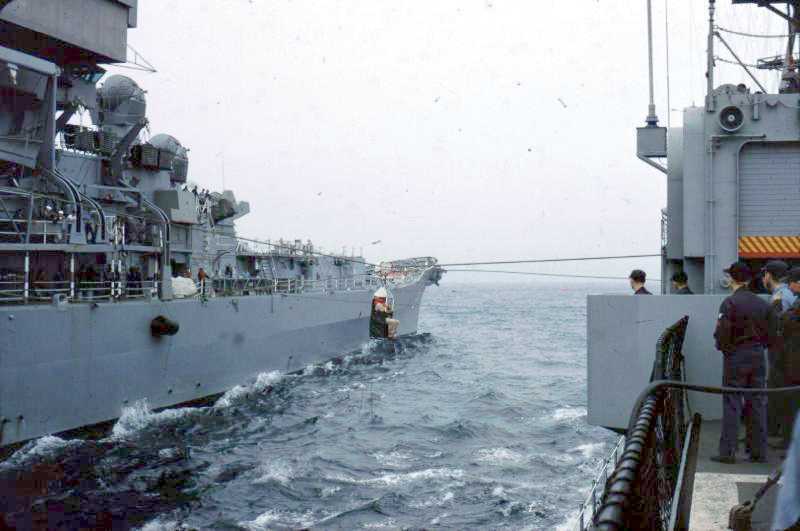 USS Long Beach (CGN 9) steaming off the Starboard bow of the USS Bainbridge (DLGN 25) en route to Pakistan. 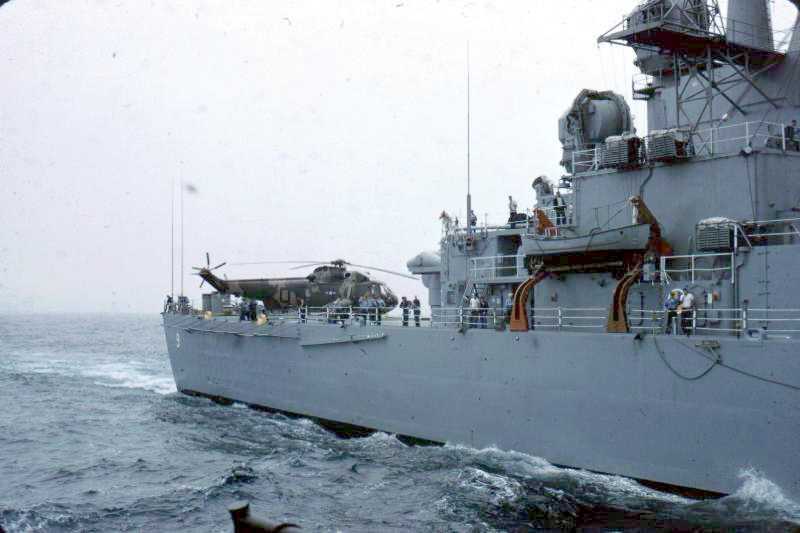 Frigate ahead of Long Beach could be a ship of Pakistan Navy. 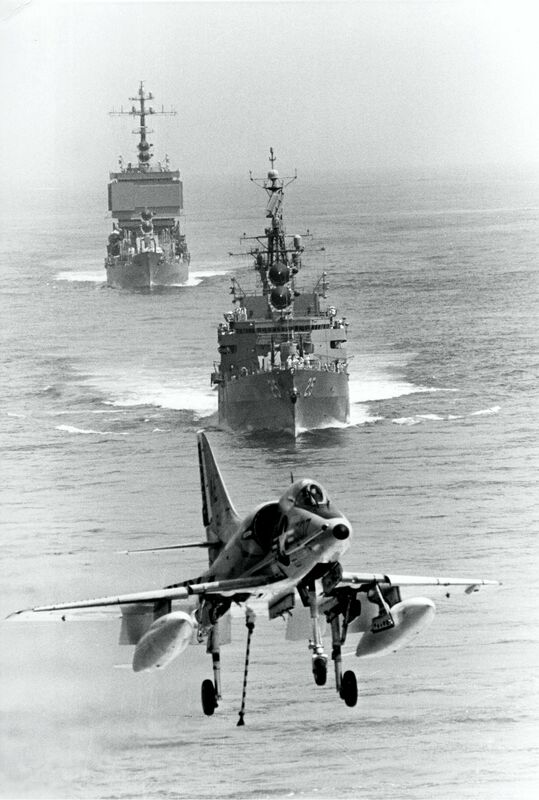 A VA-76 "Spirits" A-4C Skyhawk is about to land aboard USS Enterprise (CVN 65). 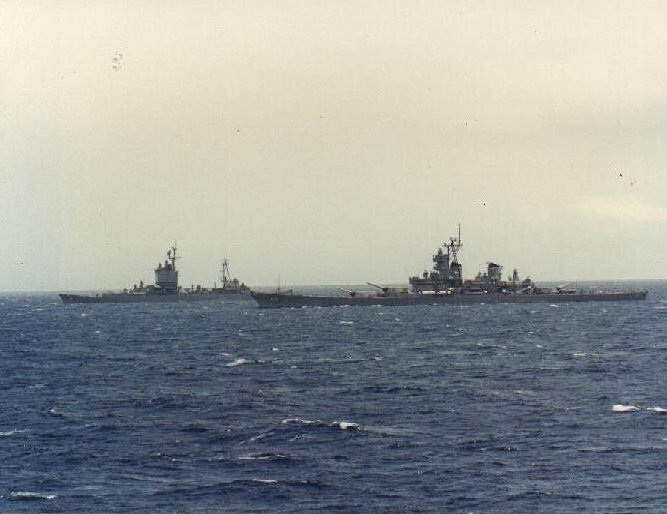 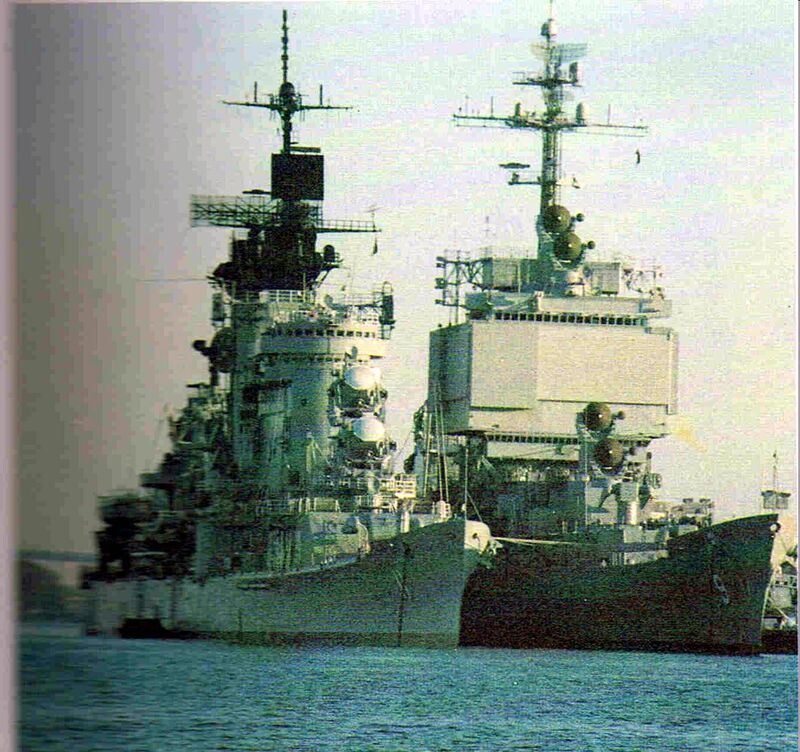 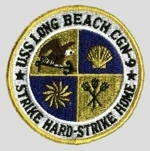 USS Bainbridge (DLGN 25) and USS Long Beach (CGN 9) are aft of Enterprise in plane guard position. 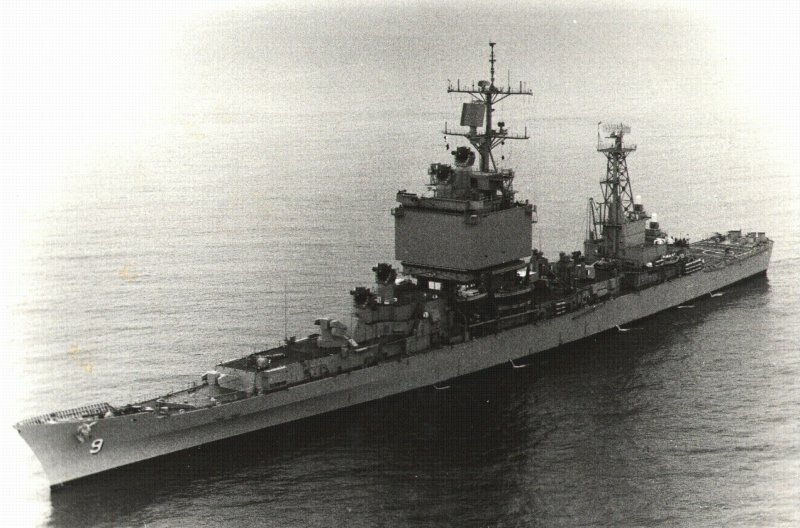 Aerial view of the nuclear-powered guided missile cruiser USS Long Beach (CGN 9) underway in 1965, location unknown. 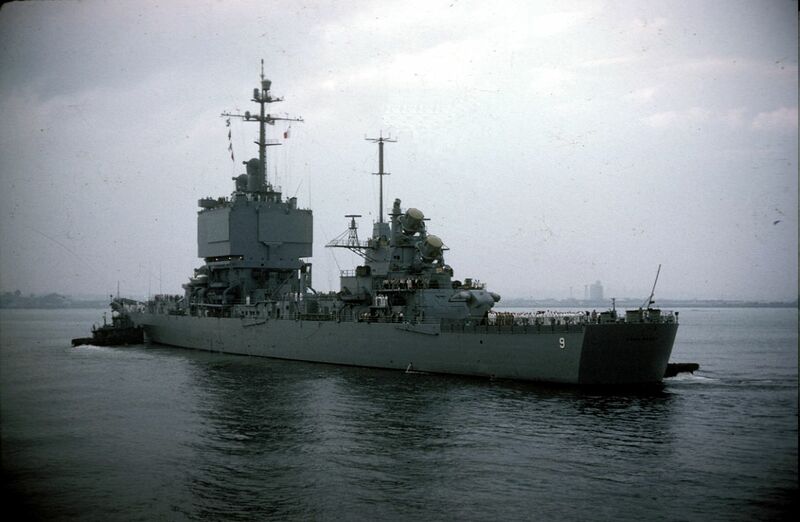 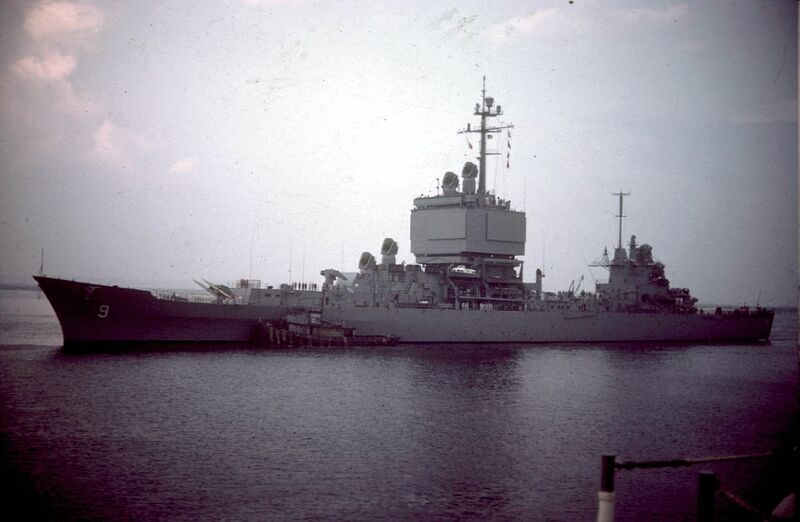 Portside view of the nuclear-powered guided missile cruiser USS Long Beach (CGN 9) underway in 1965, location unknown. 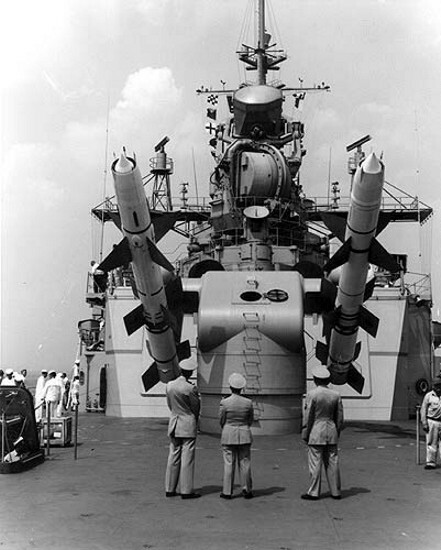 Image shows a Terrier missile being fired off the starboard side of the ship from the forward launcher (MK-10 Mod 2). 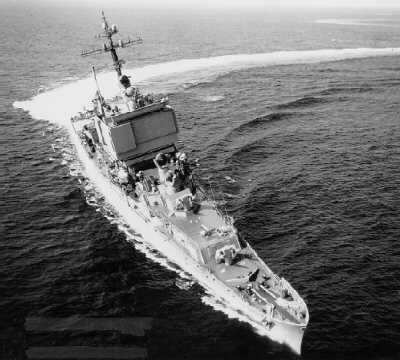 ¾ overhead view of the USS Long Beach (CGN 9) just before entering Pearl Harbor Channel, Oahu, Hawaii, 17 June 1966. 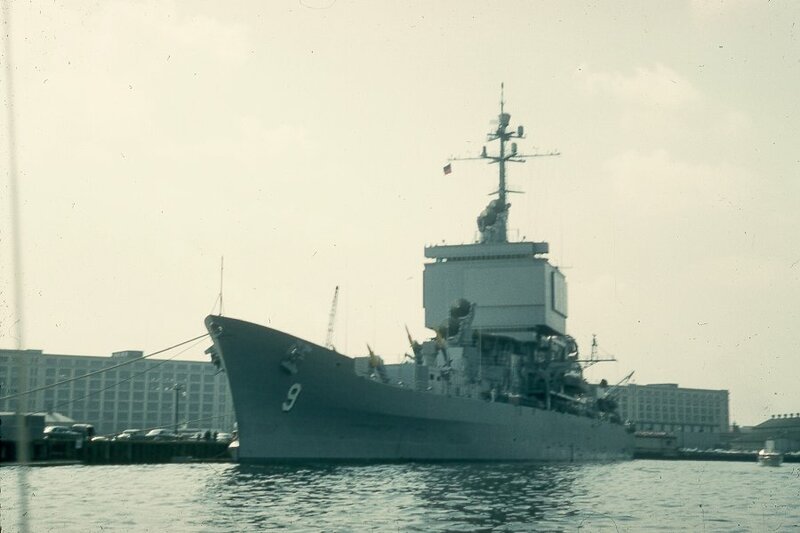 Photographer: PH1/AC  W.P. 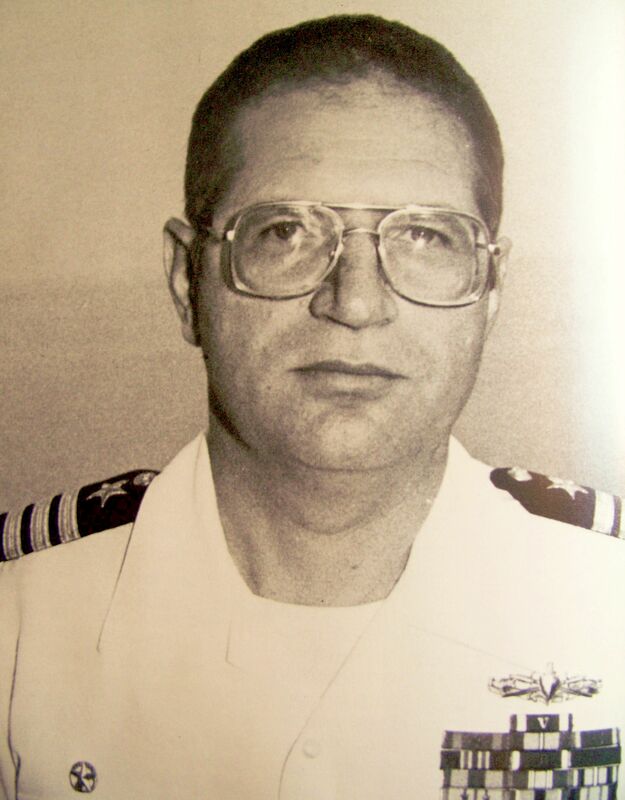 Lyons. 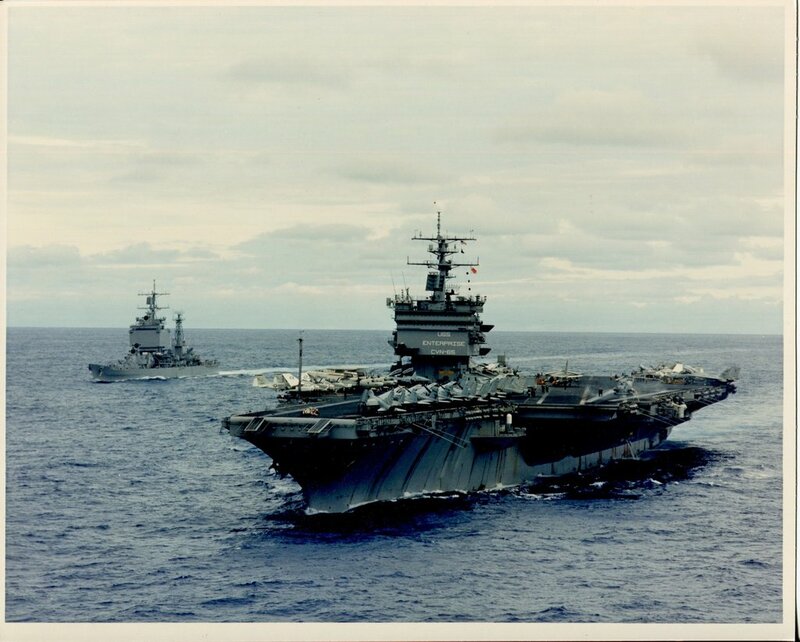 From the collection of CDR Thomas B. Ray (USS Essex CV 9). 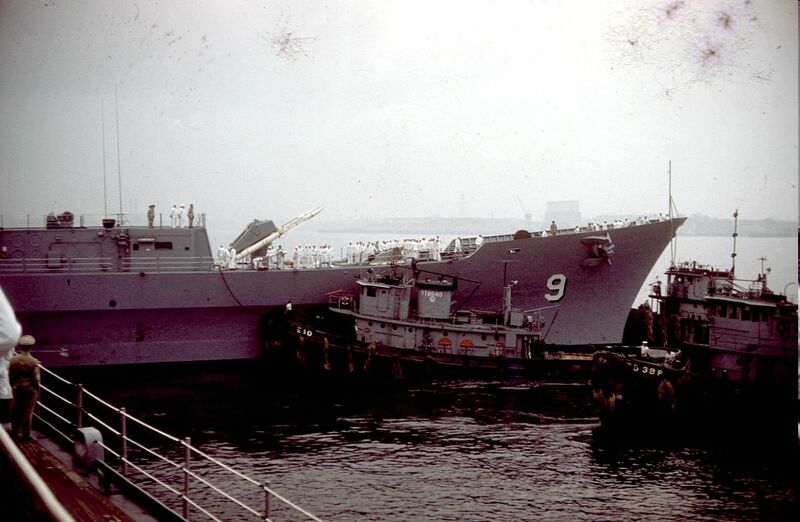 04010957 272k USS Long Beach (CGN 9) following an underway replenishment with the USS Niagara Falls (AFS 3) off the coast of Vietnam in 1969. 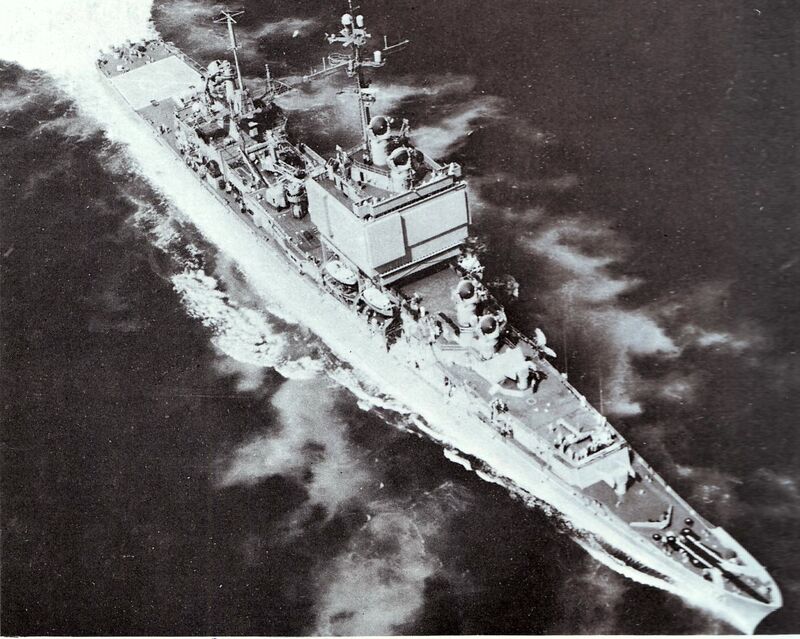 Taken from the Niagara Falls by William P. Jones, M.D. 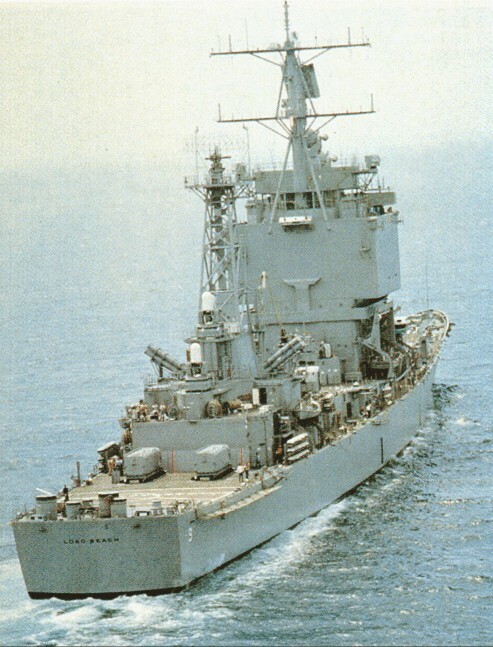 former Medical Officer USS Niagara Falls. 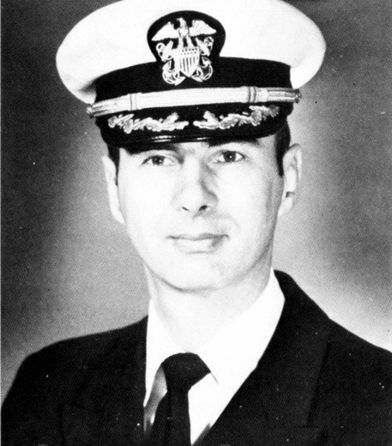 William P. Jones, M.D. 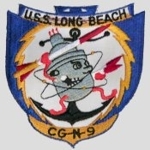 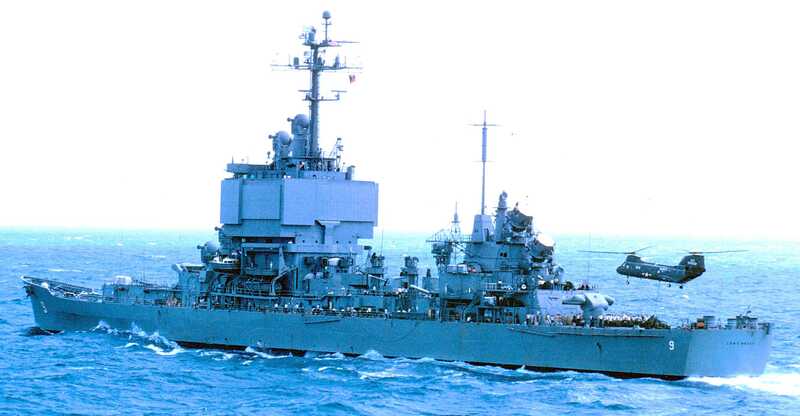 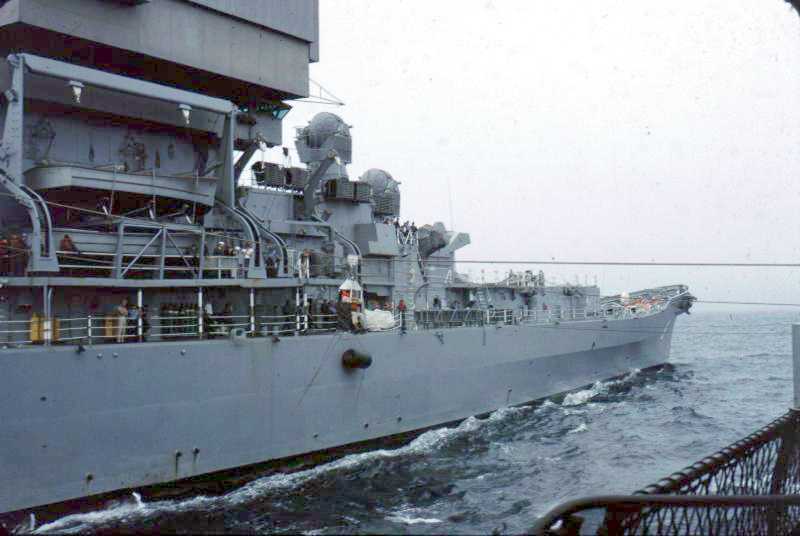 USS Long Beach (CGN 9) is about to enter Mare Island Channel on 11 March 1970. 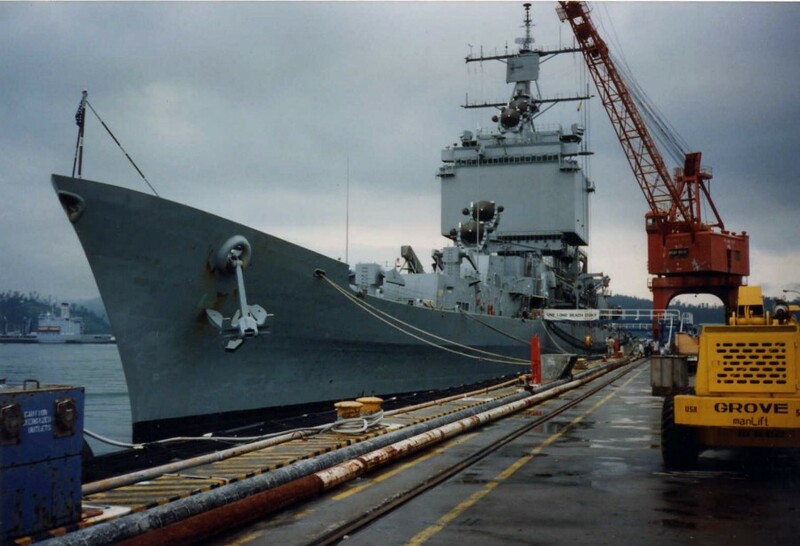 She was at the shipyard for a refueling overhaul. 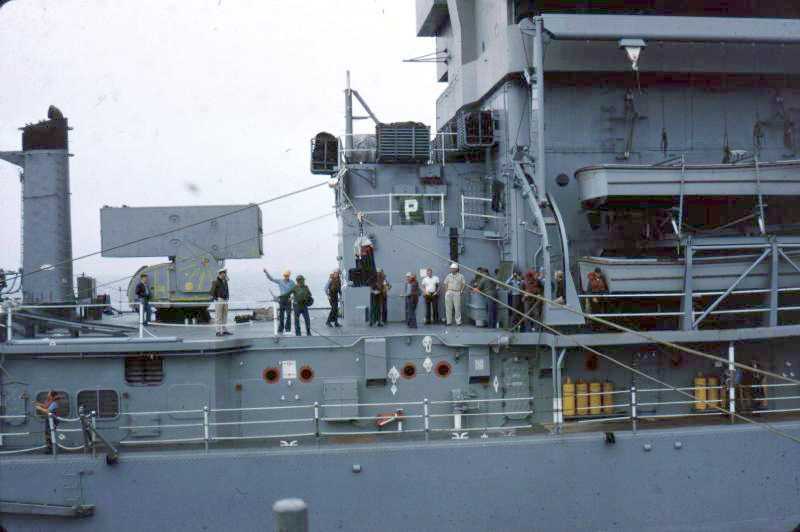 Note the Volkswagen and other vehicle on the 01 deck midships. 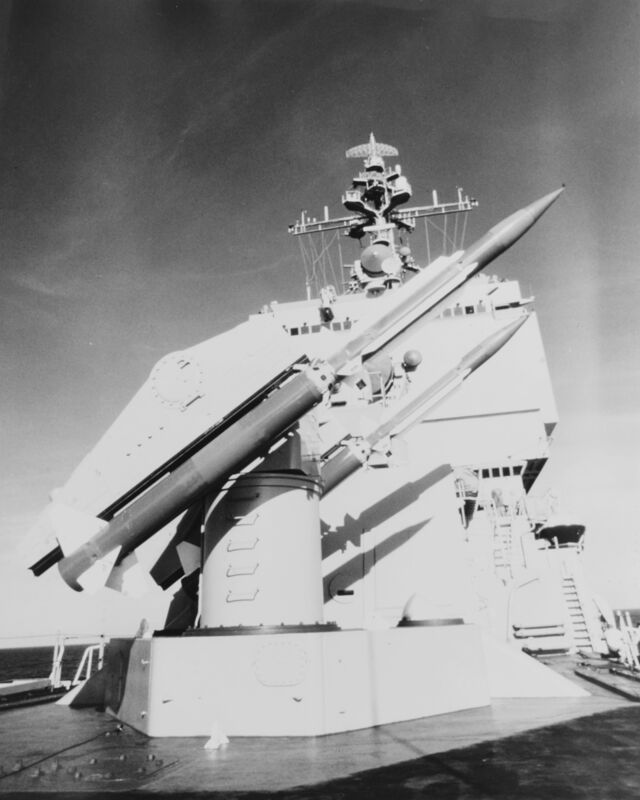 TSAM (Training Surface-to-Air) "TERRIER" Missiles on #2 launcher, while the ship was in the South China Sea, 16 December 1976. 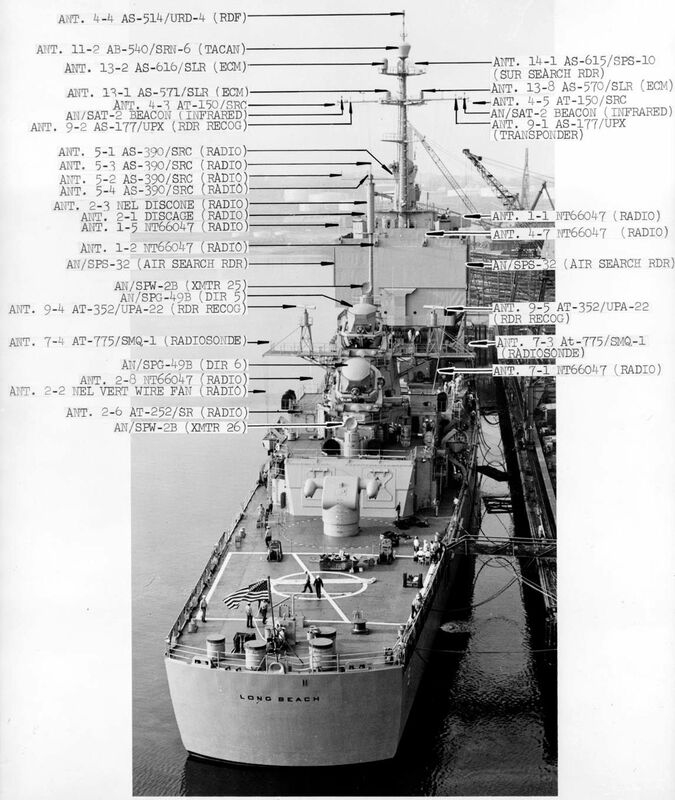 US Navy photo #MSA 163841-1-80. 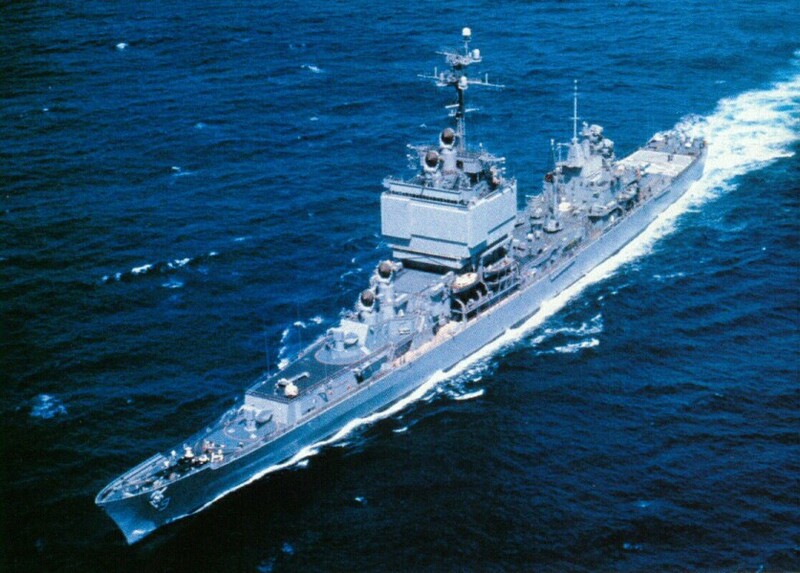 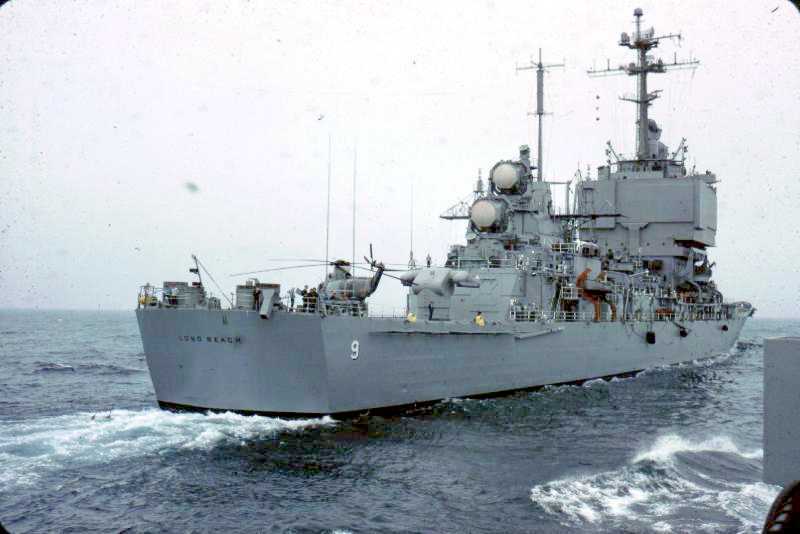 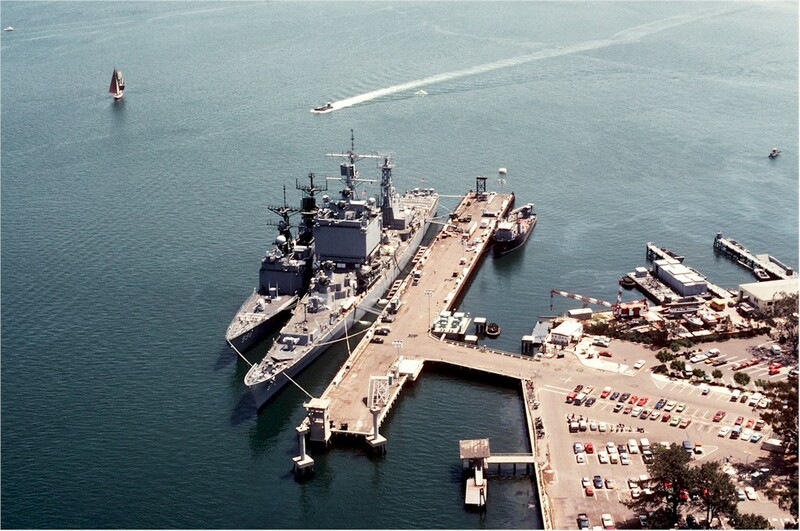 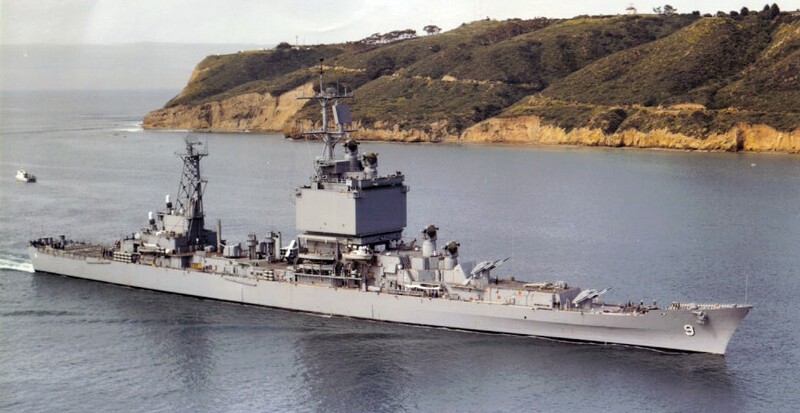 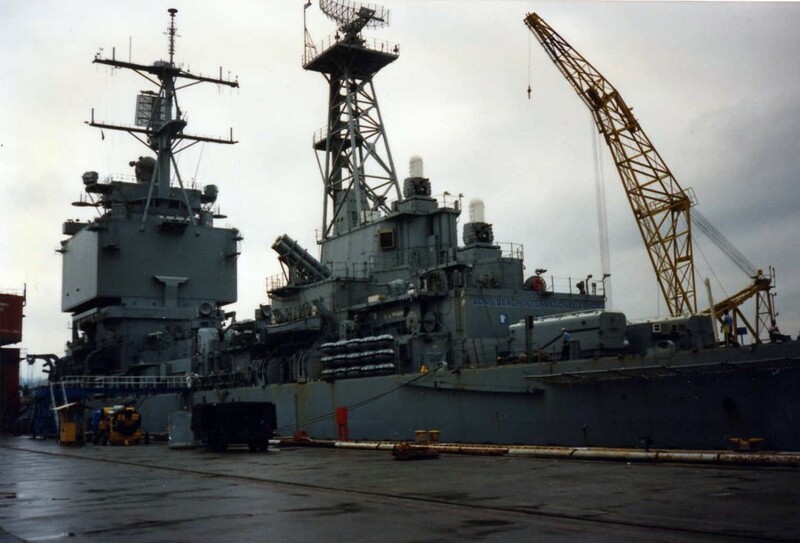 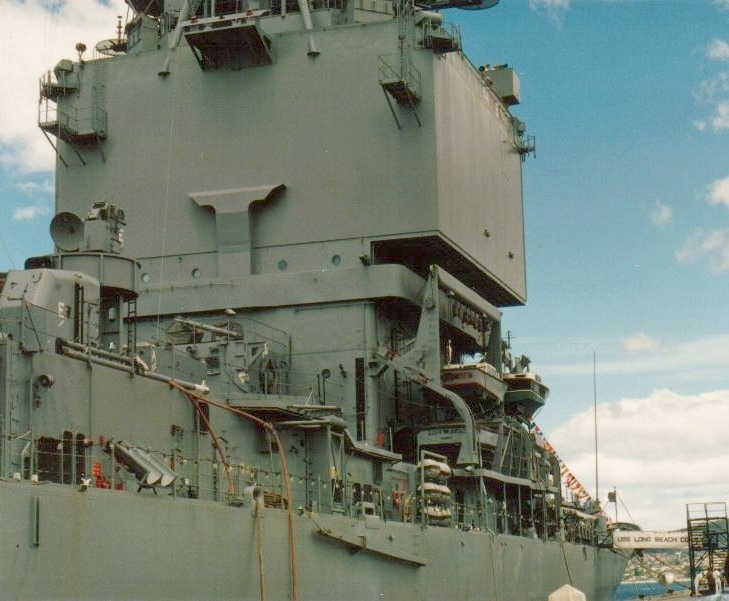 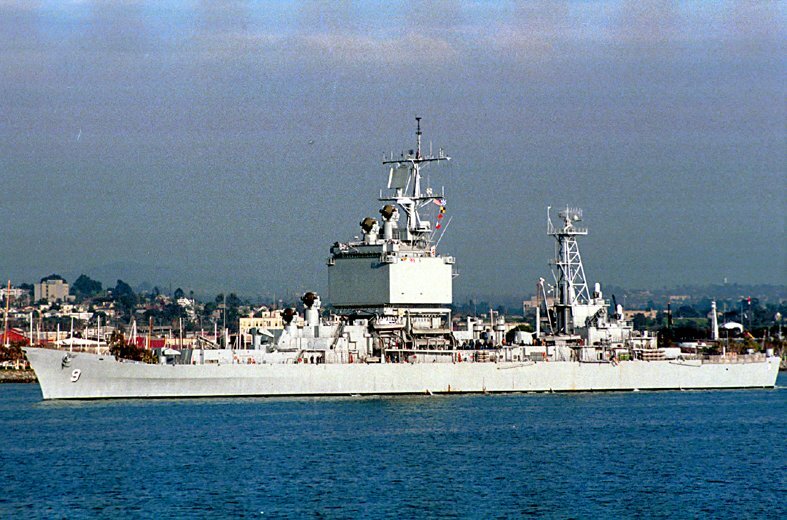 San Diego, CA, 9 April 1983 - Aerial port bow view of the nuclear-powered guided-missile cruiser USS Long Beach (CGN 9) moored to a pier at Naval Air Station North Island, with the guided-missile destroyer USS Chandler (DDG 996) nested outboard. 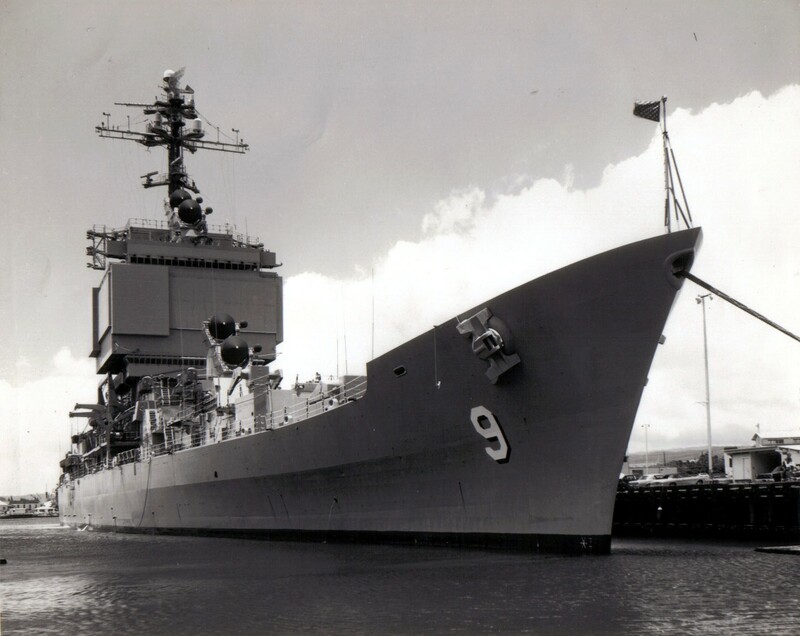 U.S. Navy photo #DN-ST-86-01900 by: PHC L. Foster. 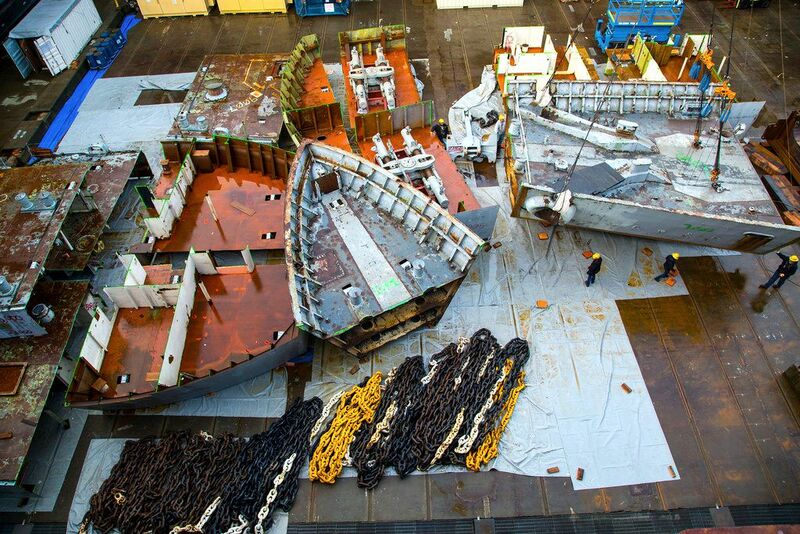 107k Heading out for local ops in Southern California. 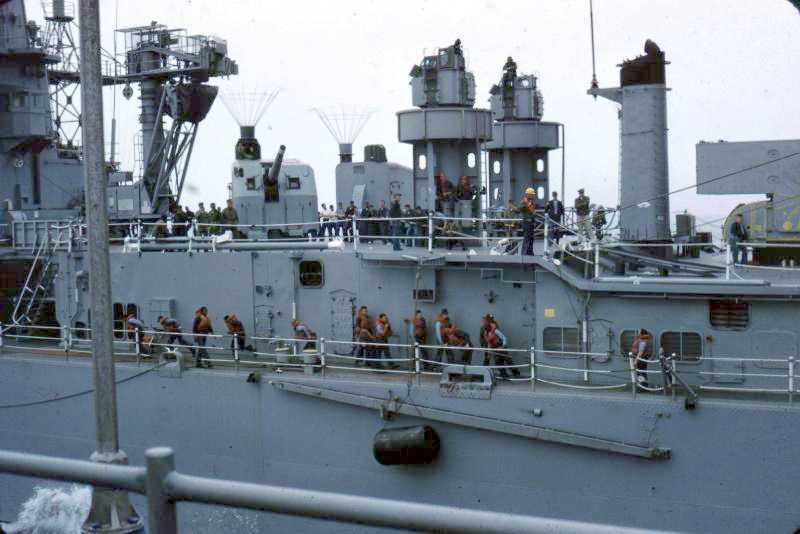 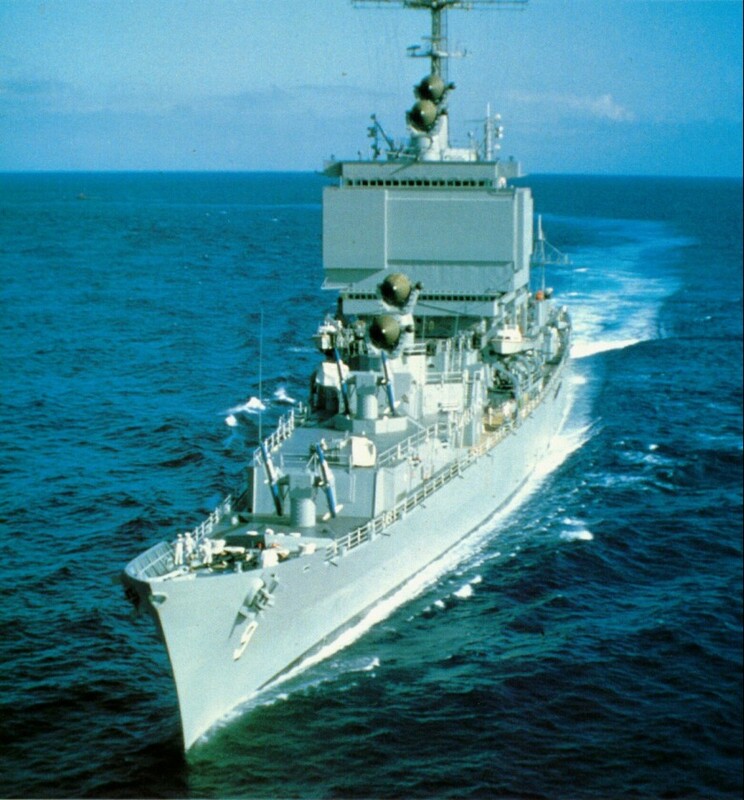 Shot taken in Feb of 1987 from the USS Coronado (AGF 11) while pierside at North Island. 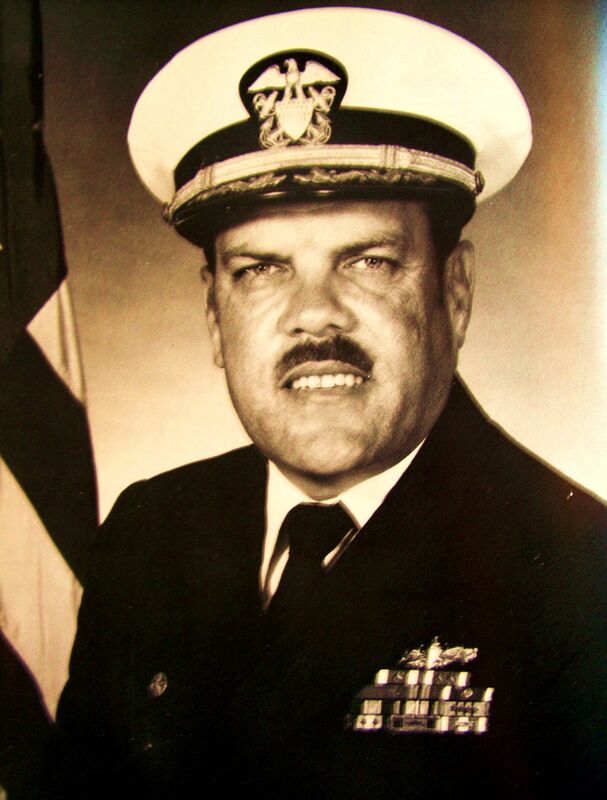 Lacy Lee, RM1 Ret. 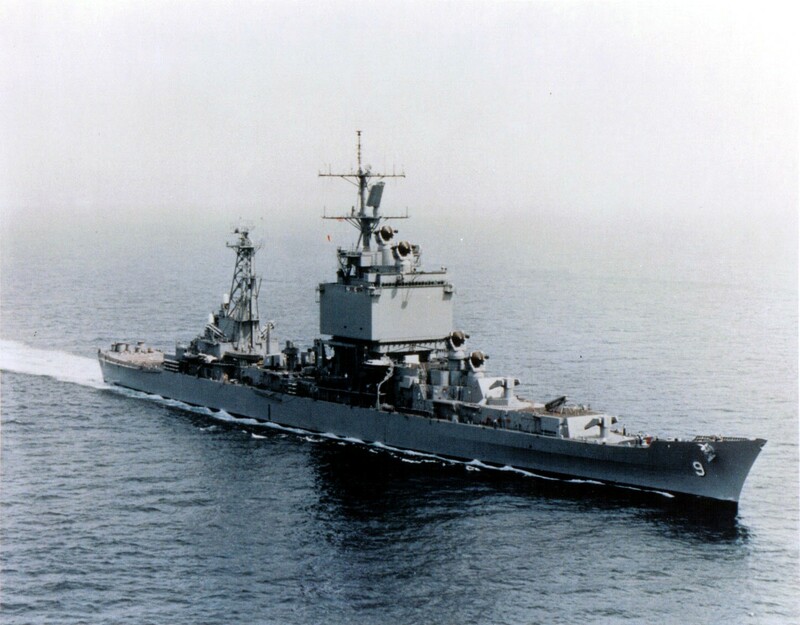 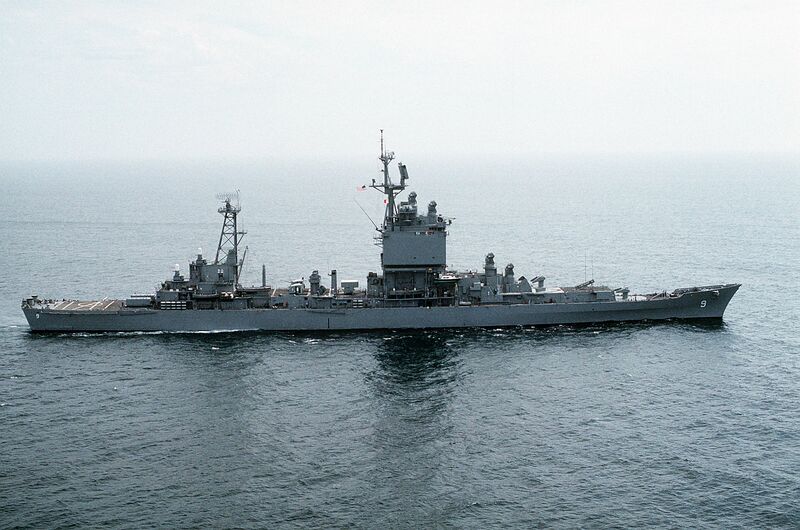 Starboard beam view of the Nuclear-Powered Guided Missile Cruiser USS Long Beach (CGN 9) underway near the coast of Southern California, on 21 June 1989. 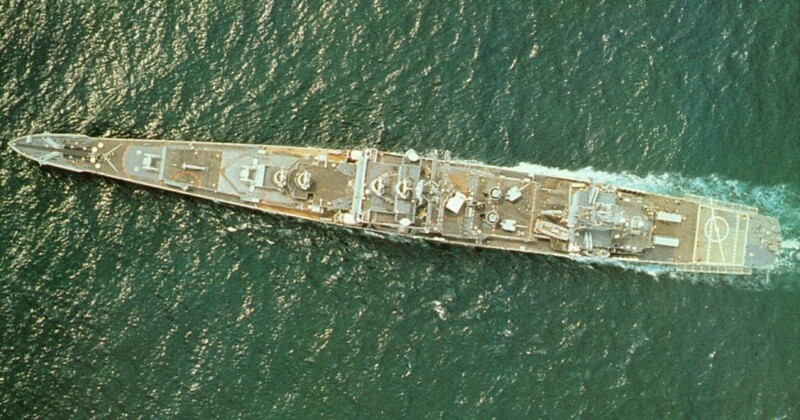 Photo taken by PH1 Wilcox. 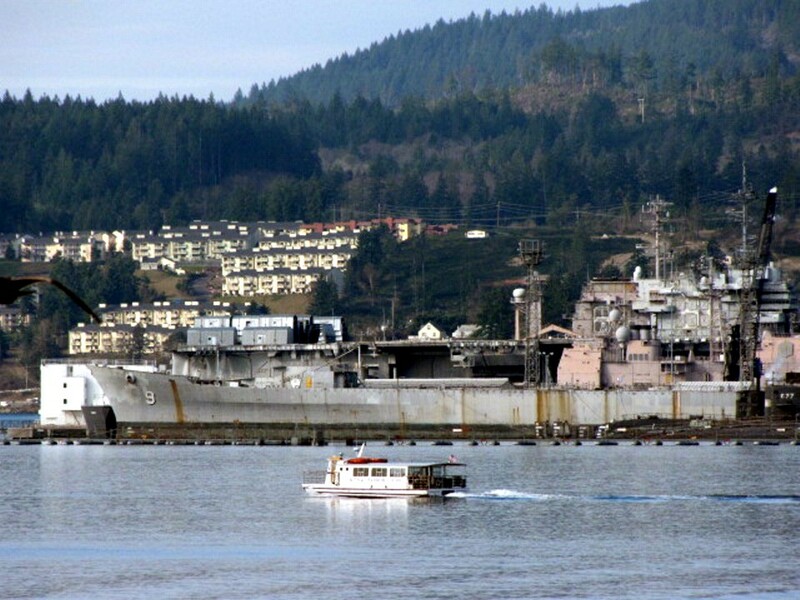 USS Nimitz (CVN 68) at Bremerton, Washington, 27 May 2011, during her Docking Planned Incremental Availability. 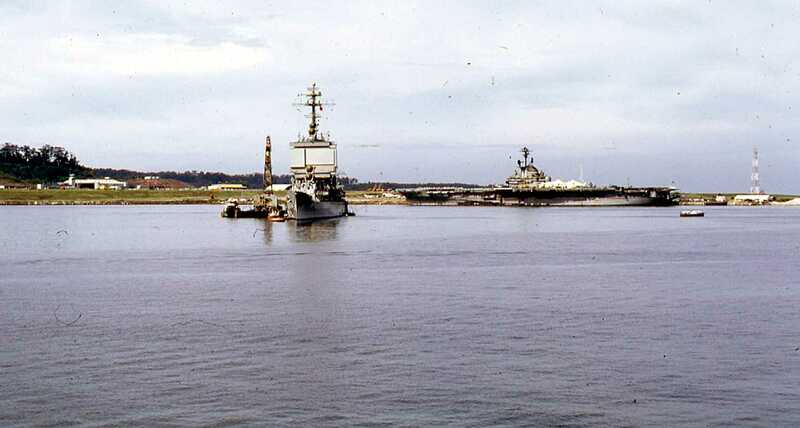 On the other side of the pier, between the camera and Nimitz, is what remains of the hull of ex-USS Long Beach (CGN 9). 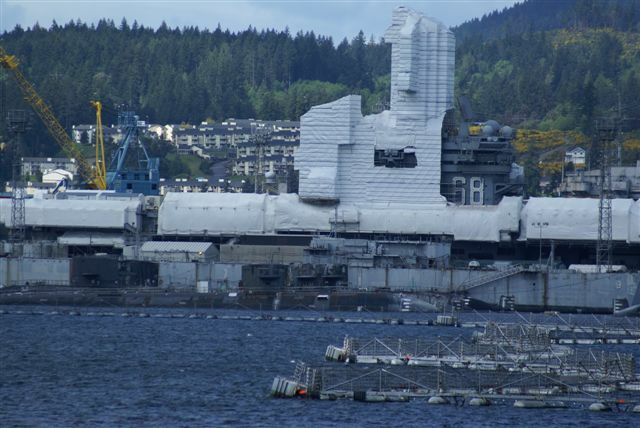 NS0268ara 61k USS Nimitz (CVN 68) at Bremerton, Washington, 27 May 2011, during her Docking Planned Incremental Availability.